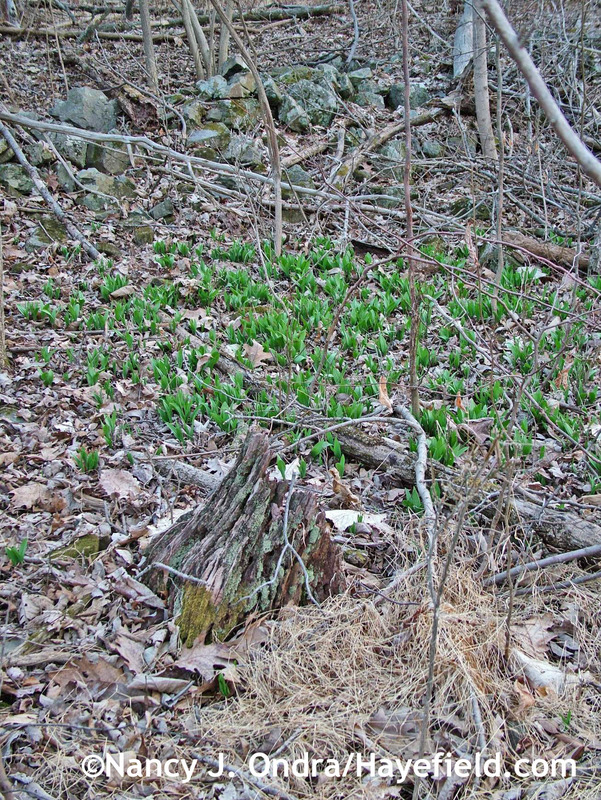 Mom and I had two reasons to take a woods walk a few days ago: Besides visiting the peepers, we were after one of our favorite spring flavors: ramps (Allium tricoccum). Getting back to the ramps patch is a lot harder than it used to be before Hurricane Sandy knocked down some of the trees back in October of 2012. Japanese stiltgrass (Microstegium vimineum) really took off in some of the newly sunny patches last summer. 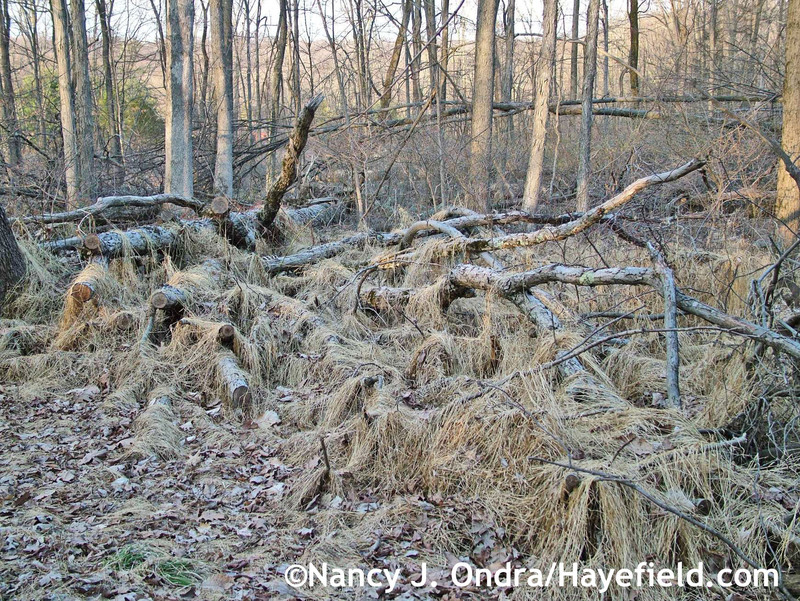 Now, the stringy remains of this invasive annual grass drape the tangled trunks, giving the woods a rather creepy appearance. 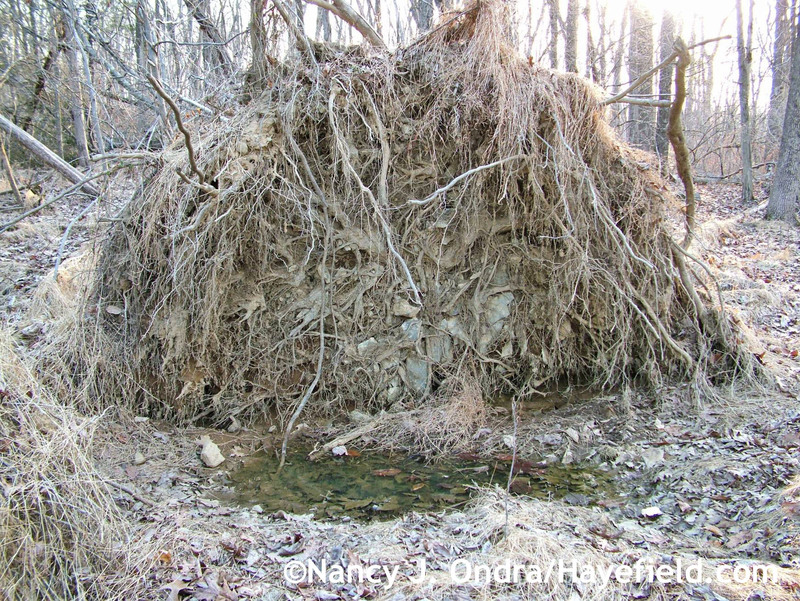 We managed to make it through the obstacle course of tangled trunks, though–passing the unfortunate remains of a young deer who wasn’t so lucky–and made it back to the ramps. They’re hard to miss, because they’re the only spot of bright green in the woods right now. We don’t take much: just a handful for each of us. They’re pretty powerful, so we don’t need many. And we find it’s better not to store them in the refrigerator more than a day or two, or everything else in the fridge starts to have the same garlicky odor and flavor. 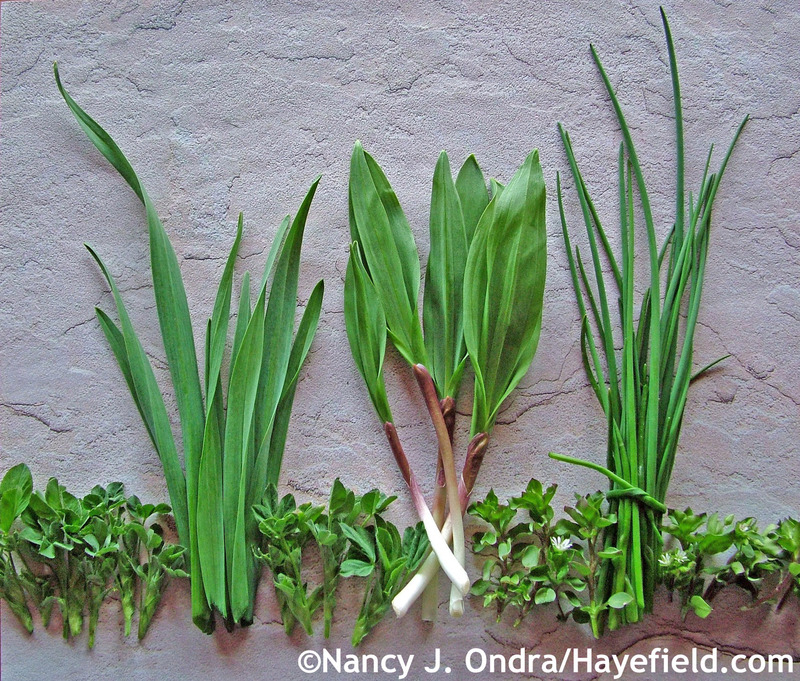 Trimmed and cleaned, ramps (in the center above) are yummy for fresh eating like scallions, or for chopping into salads. They join the first flavors harvested from the garden: tender alfalfa shoots (bottom left) and crispy chickweed tips (bottom right) for salads, and garlic greens (left) and chives (right) for pesto. After months of using dried nettles for infusions, it’s a treat to have fresh shoots now. The dried leaves have a rather powerful flavor that’s an acquired taste (I usually mix them with a bit of peppermint to make them palatable), but the milder infusion from the fresh shoots has a delicious, light flavor that tastes as green as the leaves look. 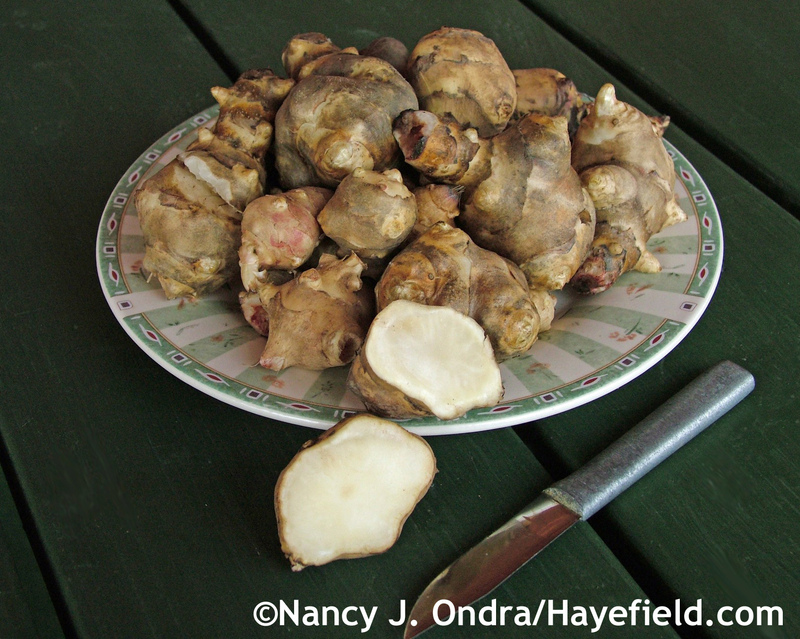 I didn’t get around to harvesting any Jerusalem artichoke (Helianthus tuberosus) tubers before the winter snow arrived, so I’m counting them as part of the spring harvest this year. They’re still deliciously crispy, with a flavor somewhere between a white potato and a Granny Smith apple. 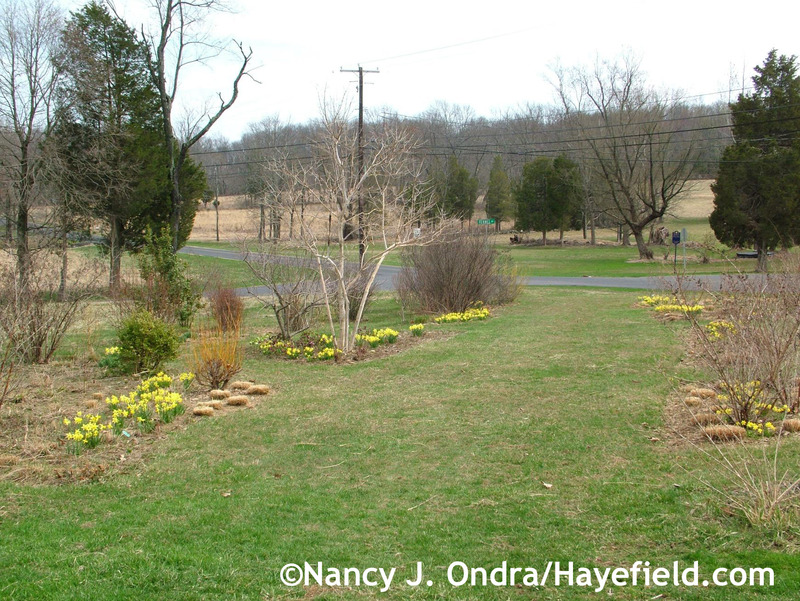 Though sounds and flavors are among my favorite signs of spring, the sights are what make this post suited for Garden Bloggers’ Bloom Day. The theme here is “making much of little”: in other words, lots of close-ups of short-of-stature plants, since they’re mostly what’s been in bloom so far. 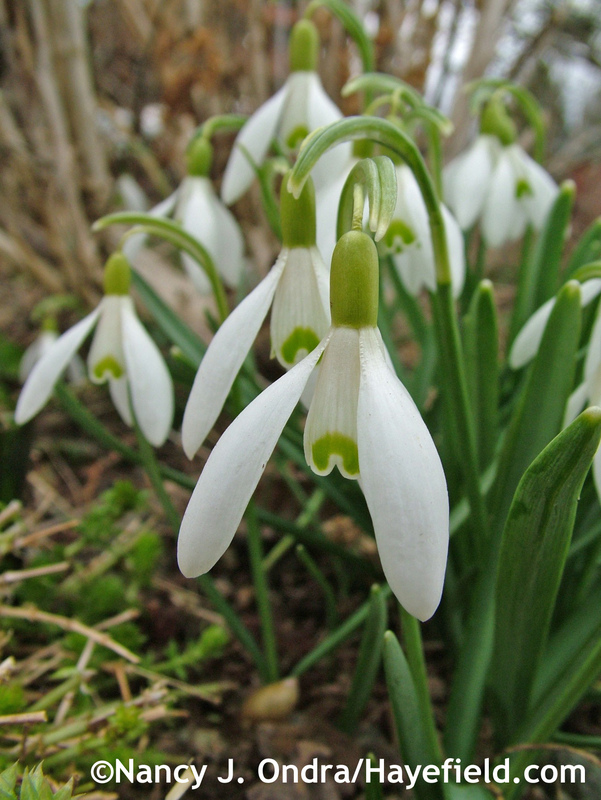 Common snowdrops (Galanthus nivalis) are among the first flowers, of course, followed closely by spring meadow saffron (Bulbocodium vernum). and ‘Jeanne d’Arc’, with white petals just barely brushed with purple toward the base. 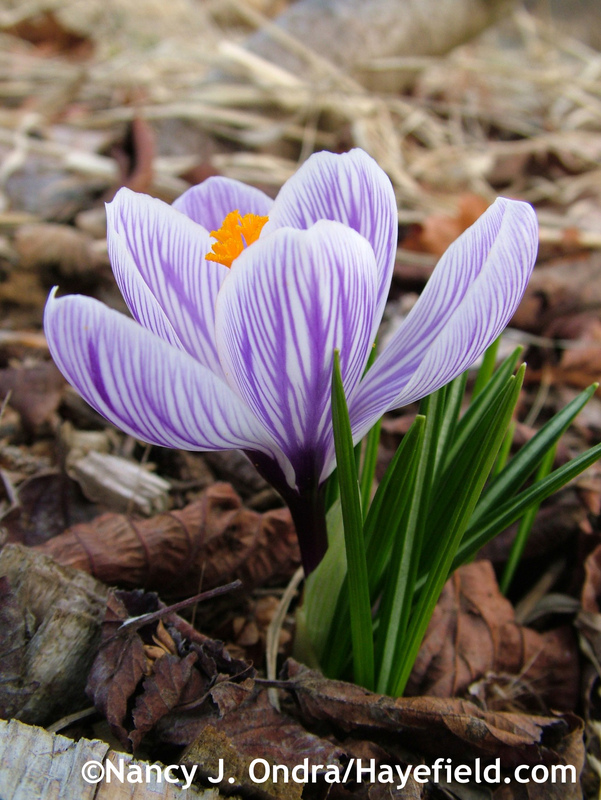 These various spring beauties didn’t last all that long: about 12 days for the snowdrops, 2 days for the spring meadow saffron, and anywhere from a few hours to a few days for the crocuses (however long it takes for the deer and/or bunnies to find and feast on them). 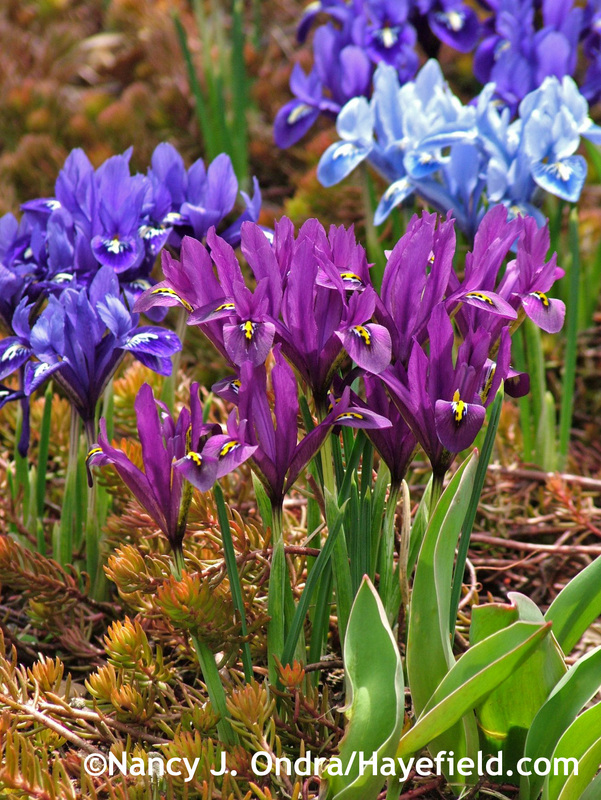 As all of these have come and gone, the reticulated irises (Iris reticulata) have been stunning for almost 3 weeks now. 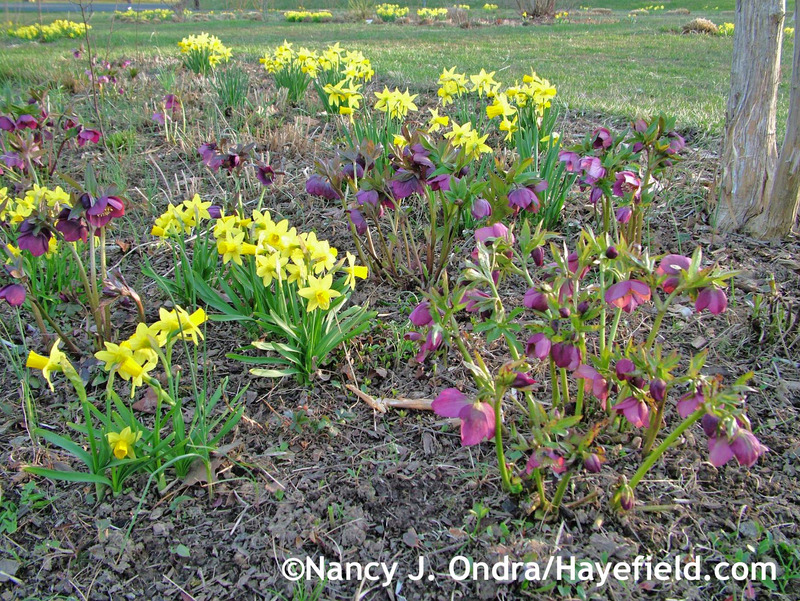 This “Rock Garden Mixture” has gotten better every year—except for the solid yellow Iris danfordiae, which disappeared after the first season. Deep blue ‘Harmony’ is a stunner, too. 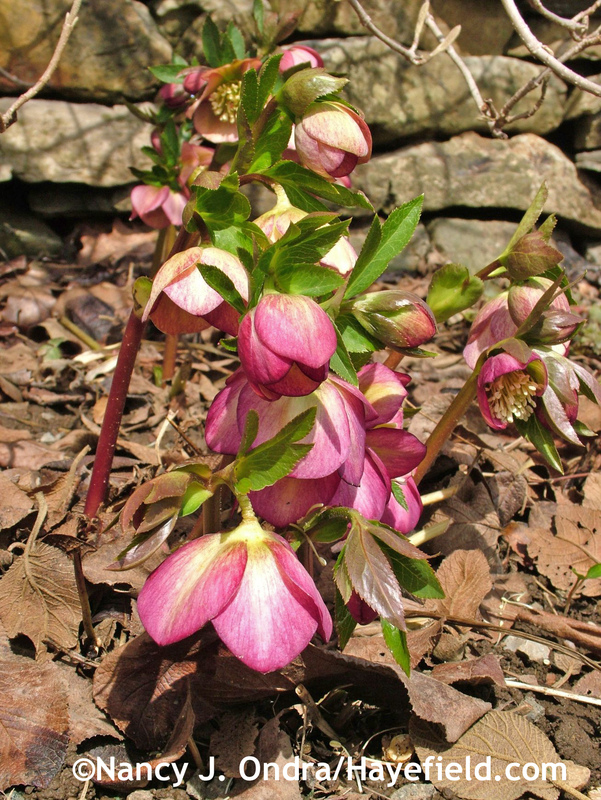 …followed by the larger-flowered and more-colorful hybrid Lenten roses (H. x hybridus). None of these have names, so this is just a gallery of some personal favorites that I plan to collect seed from this summer. Some features that I look for include rich “petal” (sepal) colors, pretty shading on the outside, heavy spotting inside, dark nectaries (the ring around the center of the bloom), overlapping sepals, double forms, and overall vigor. …as well as the rest of The Shrubbery. I give all of these areas a rough cut first with my brush mower, then do a hand trim to neaten up the clumps before raking them out. 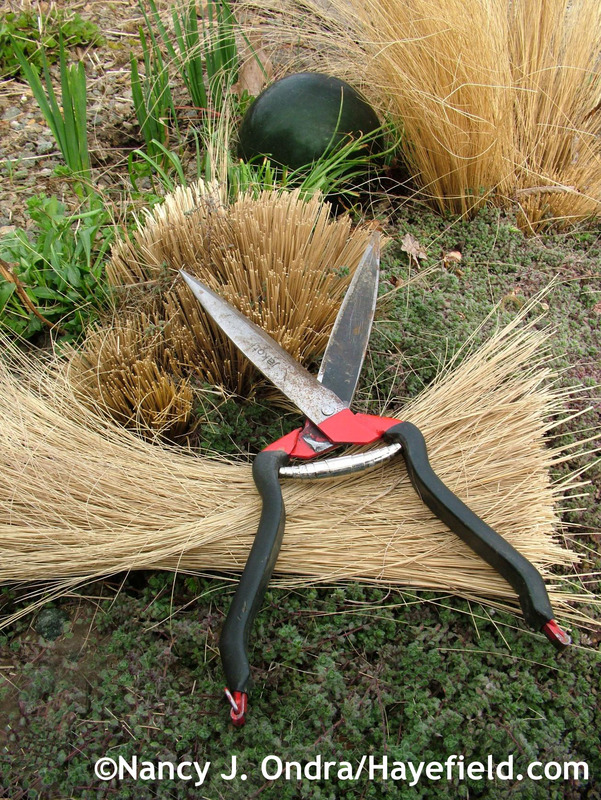 I’ve been breezing through my clean-up chores this spring thanks to my Jakoti hand shears. I wasn’t going to mention them again so soon—I wrote about them just a few months ago in Shear Genius—but I still think they’re brilliant after using them through many days of cleanup. You can see that they’re not as shiny as they were in December, but they’re still wonderfully sharp even after chewing through tall grasses—enough to do a great job even on the Mexican feather grass (Stipa tenuissima), which I usually have to cut back with my old alpaca-shearing scissors. 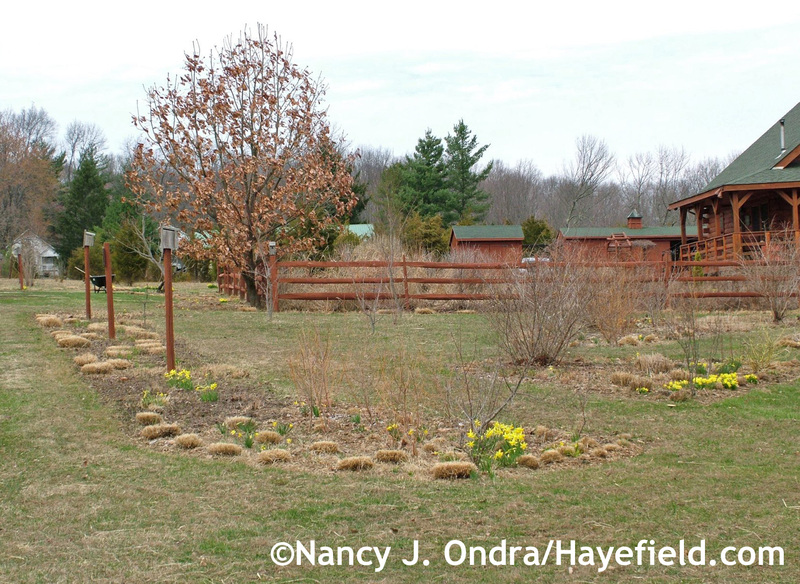 I haul most of the garden debris out back and spread it over the meadow, but I carefully collect the tops of the Mexican feather grass—and the bronze sedges (Carex) and little bluestem (Schizachyrium scoparium), too—for use as mulches in the vegetable garden. 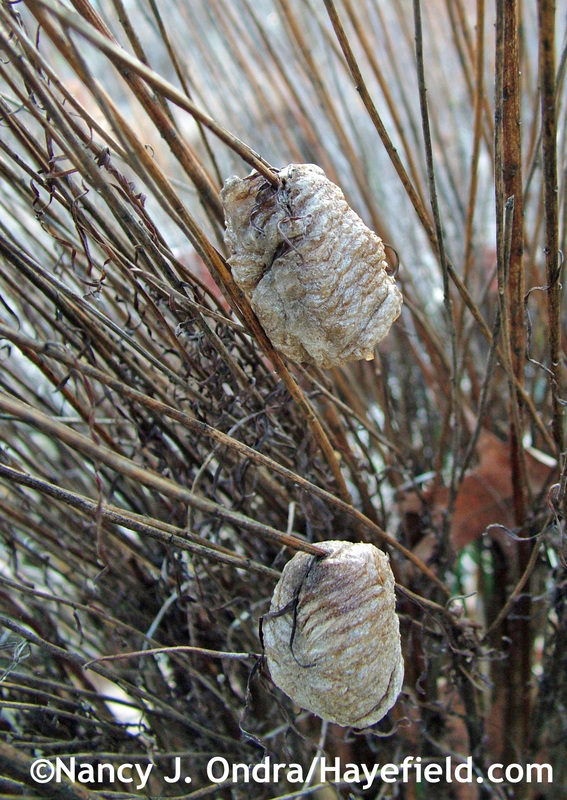 The only thing that’s really slowed down the cleanup process is the unusually large number of praying mantis egg cases on the dried perennial stems this year. I like to trim them out by hand and tuck them into nearby twiggy shrubs, so they will (I hope) be safe from birds and will hatch at the appropriate time. 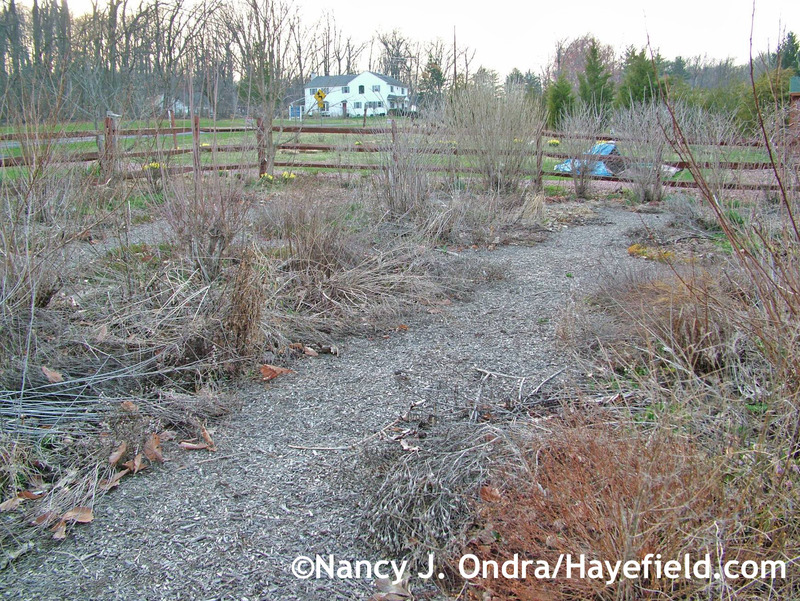 …but I’m hoping that the five large clumps I transplanted will be vigorous enough to keep the meadow grasses from creeping back under the winterberries down on the corner. 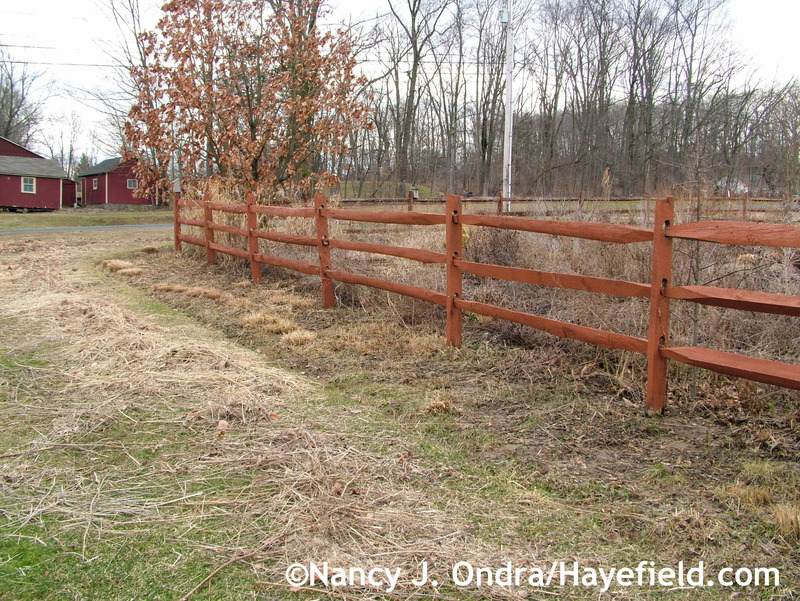 And, I’ll have a new area to play with inside the fence, once I get the craters filled in. …but they’re lucky I’ve resisted the temptation to start shearing them, because we’re back to more spring-like weather now, thank goodness. Time enough for that yearly ritual in a few weeks. 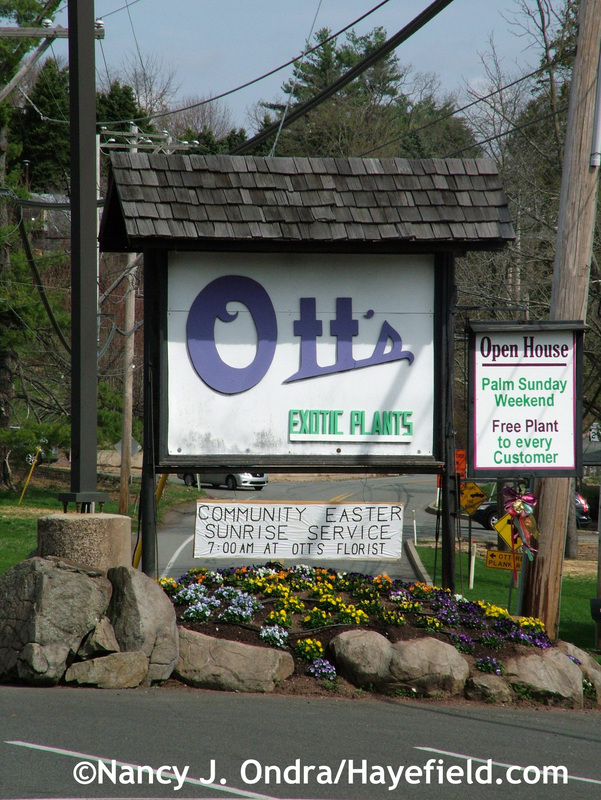 Speaking of spring rituals: If you live in southeastern Pennsylvania, this is a great time to make a visit to Ott’s Exotic Plants in Schwenksville. 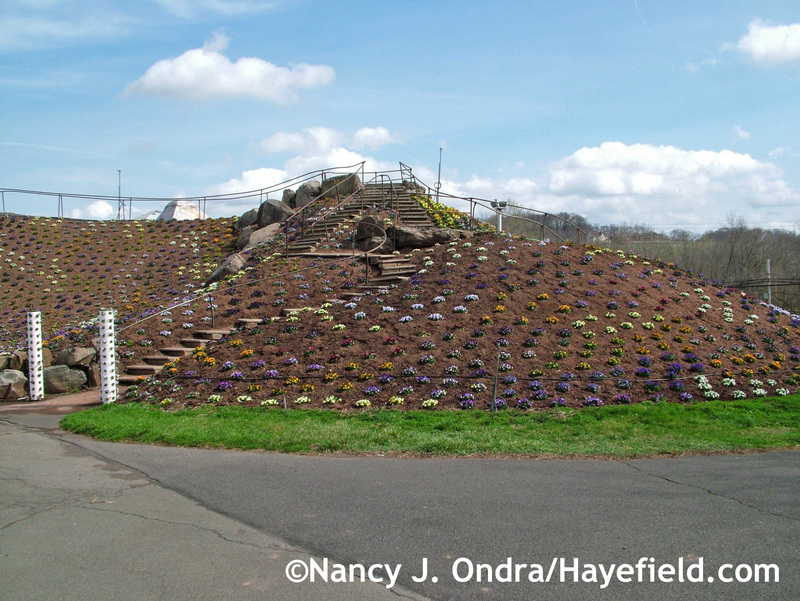 There are lots of of interesting tropicals and hardy plants in the greenhouses and conservatory, but the real must-see this time of year is the pansy mountain. 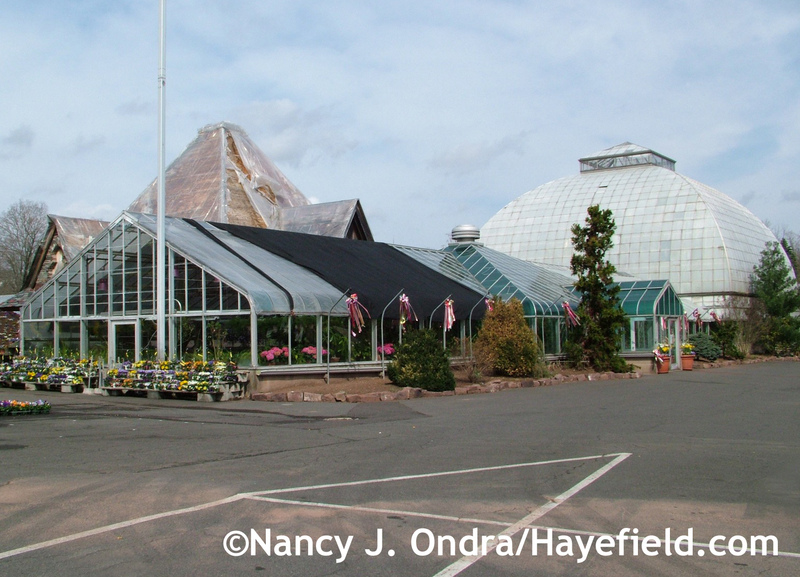 If I understand the story correctly, 1914 refers to the establishment of the family business in the area, and 1964 was the start of the current greenhouse. I’m not sure when the mountain itself first appeared, but it’s been there as long as I can remember. 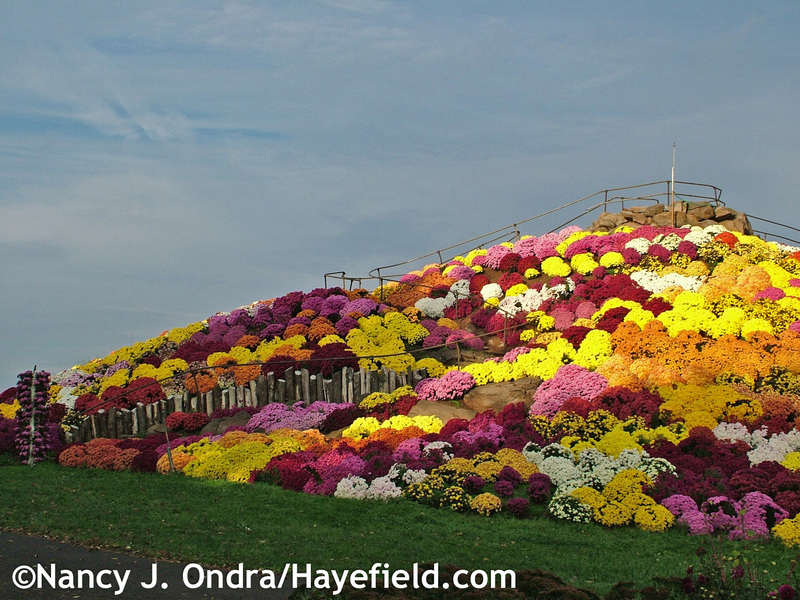 In fall, it’s covered with mums. Now, the pansies get their turn. 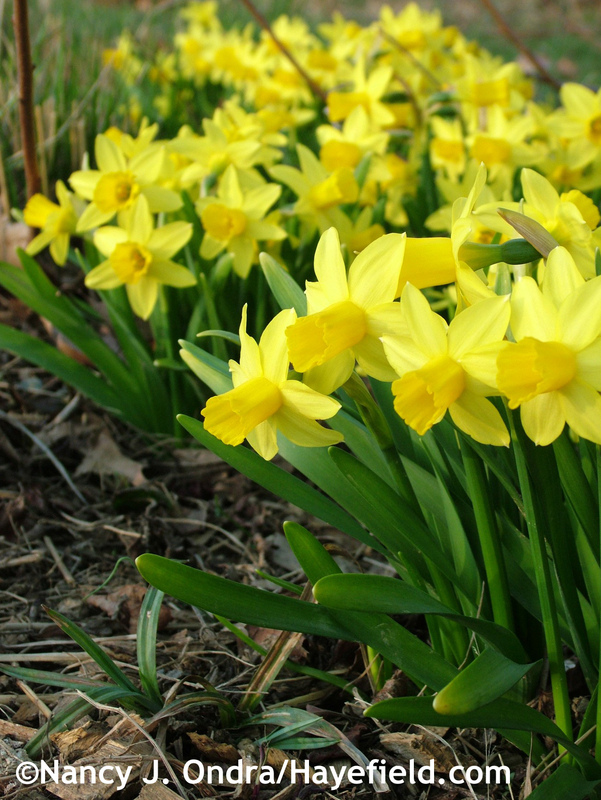 It’s a little early yet—they’ll be at their peak in May—but you can get an idea of the effect even in mid-April. I realize that this sort of spectacle isn’t to everyone’s taste, but you kind of have to admire the sheer audacity of the thing and the effort put into producing this twice-yearly phenomenon, and it’s really worth at least one visit as a life experience. 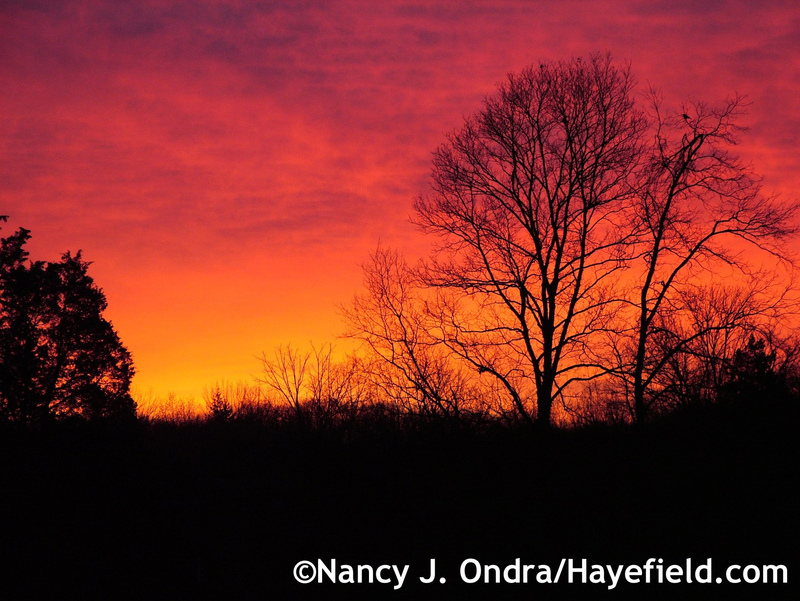 Well, that’s all the news from Hayefield and its environs for today. 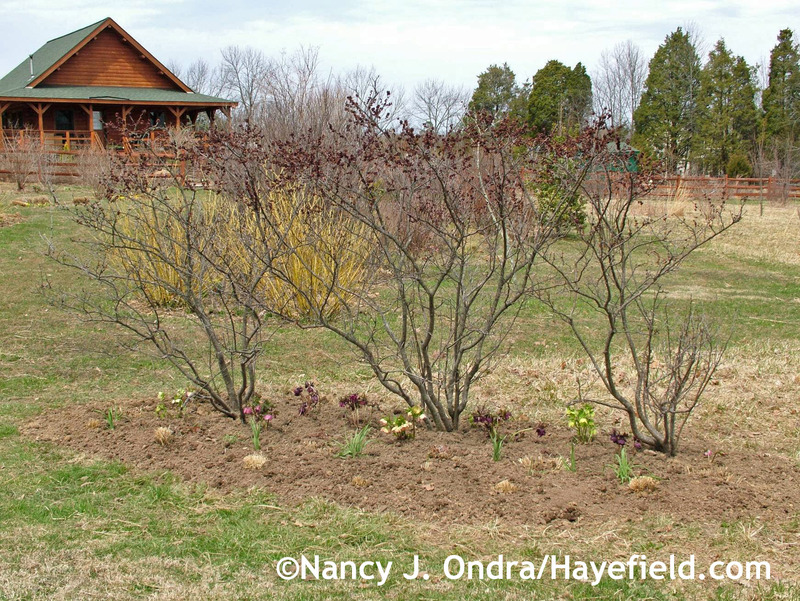 To see what’s springing up in other gardens all over the world, check out Carol’s main Bloom Day post at May Dreams Gardens. Enjoy your tour! 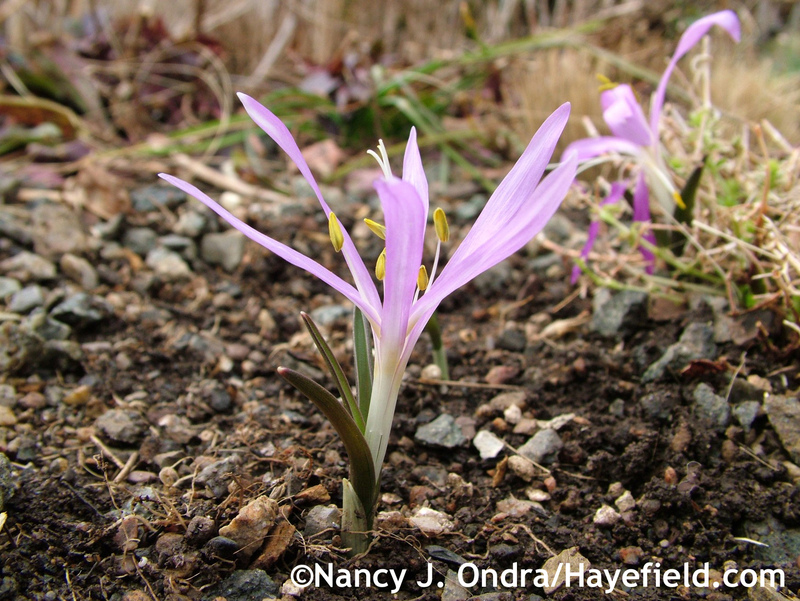 Wow… what a great post for the day… love that meadow saffron, and the praying mantis egg cases! Wish we had that delightful insect here in Nova Scotia. 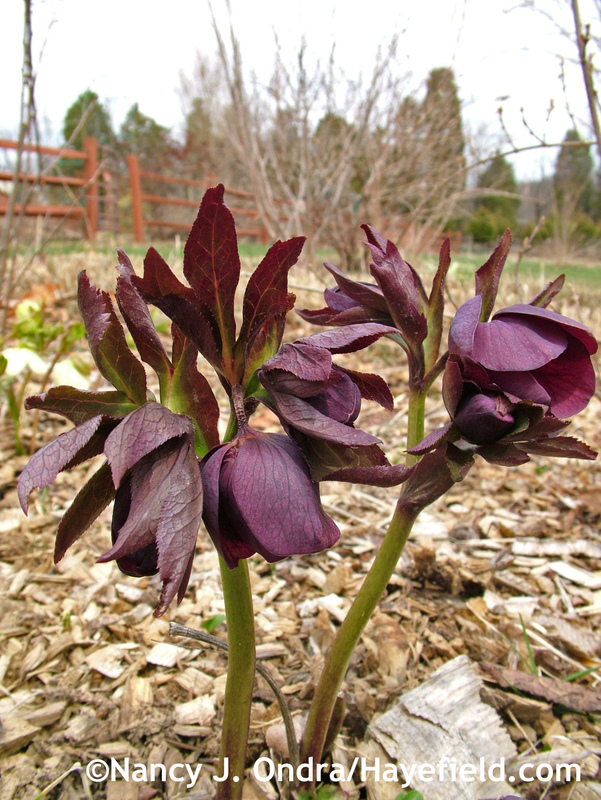 And all those hellebores… I know I need to plant some… only have one or two. Good morning, Jeff! I wasn’t aware that you didn’t have praying mantises up there. They are fascinating garden companions. 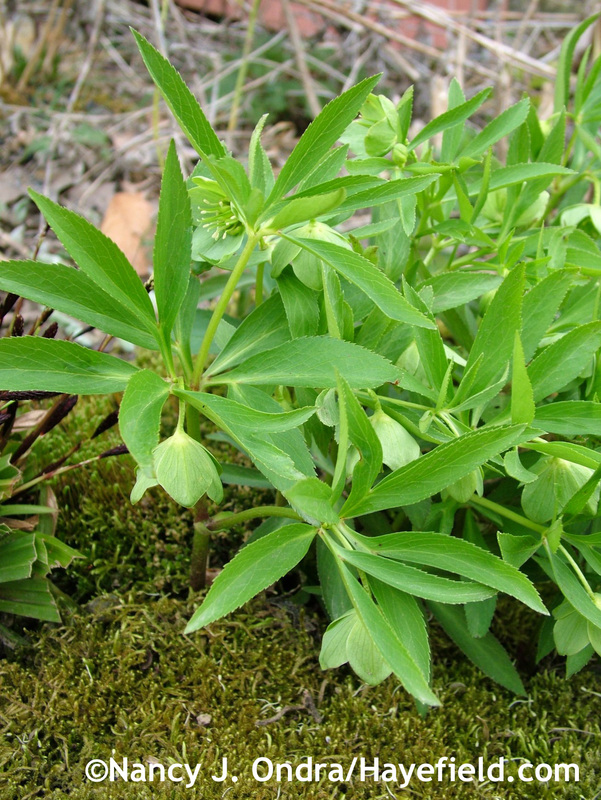 And the hellebores…well, once you have one and let it produce and drop seed, you’ll probably have plenty of seedlings after a few years. The jakoti hand shears (and your brother) are great! They made garden clean-up so easy and pleasurable (the shears, not Tim😃). So nice to see your garden pics as I’m waking up this morning. I refuse to open my curtains just yet. Here in wisconsin it snowed again last night ad I simply DO NOT want to look at it!!!! Warmest regards and be well! Hey there, Liz – great to hear from you! I’m so sorry about the snow, but I’m thrilled to know that you too love your Jakoti shears. Tim gave me an extra pair for the boys. If they make alpaca shearing as easy as they’ve made garden cleanup, the three of us are going to be very happy campers. Well, here’s hoping that your snow disappears soon so you can get on with the growing season. Have fun with your seeds. I woke up this morning to an inch of snow on the ground. Are you getting this too? 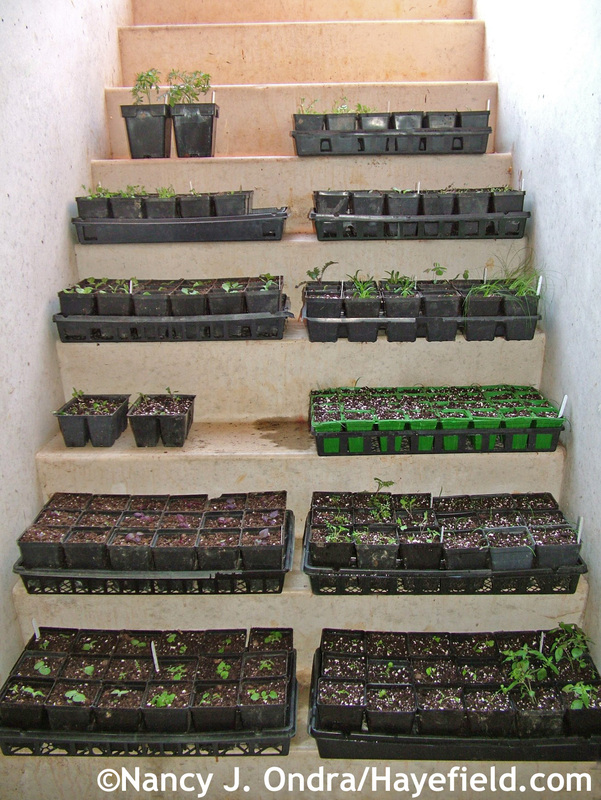 Your seedlings are doing very well; it’s been a challenge to keep everything warm this past few weeks. Consequently, my planting schedule is a tad behind schedule, but I’m hoping things will catch up and all will be tickety-boo. Growing hellebores from seed really isn’t difficult, Liat; it just takes some patience. You don’t absolutely *have* to start with fresh seed, but it works out well if you can do that. They need a warm period first, then germinate in cool conditions. If you sow the seeds when they ripen in July, then they get their needed warm period through the rest of that summer and start germinating in winter or spring. 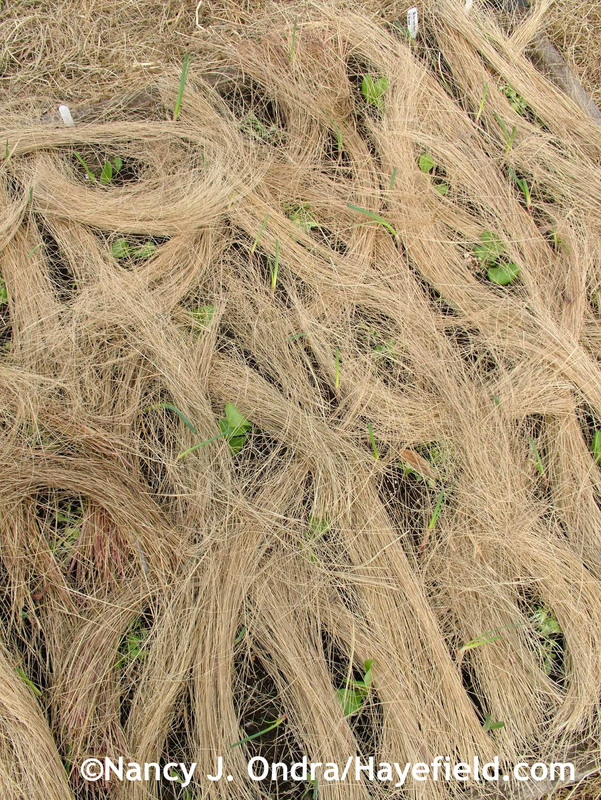 Normally, I just let my plants self-sow (which they do readily), dig up the seedlings around them the following spring, and then grow them on in my holding beds. But I decided to collect some seeds this year to sell through my Etsy shop, for folks who want fresh seed to sow this summer. No snow here yet, thank goodness. Possibly tonight! Well, that was a great look at the early stages of your forthcoming bounty. You must have spent some time on your tummy for some of those shots. Those alpacas look so calm, not noticing how much much work you devoted to creating the gardens we drink in when they appear in our mailboxes. Happy Bloom Day, Nancy. Yes, I was glad when the soil dried out and warmed up a bit to make ground-level photography more comfortable. But I’m also very happy that we’re getting a soaking rain today, to settle in all the plants I’ve been moving. The boys are indeed plenty calm right now; they’ve been too warm to do much besides grazing and sleeping. At least they haven’t been fussing to go for a walk for the past few days! 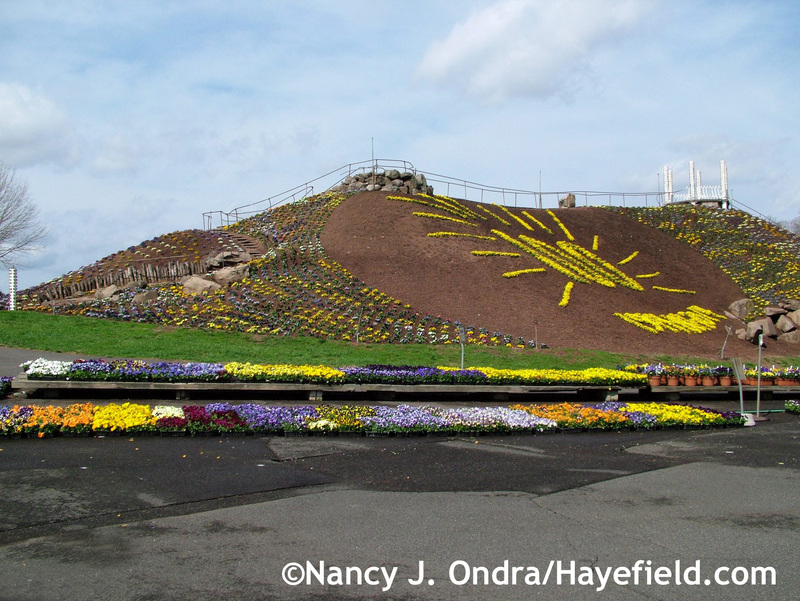 I love the flower mountain – both in the autumn and now – and all the other photos of spring flowers too! (In Swedish: Ramslök) Allium ursinum with white flowers and a mild taste of garlic – which I dont like. (In Swedish: Kajplök) Allium scorodoprasum with burgundy flowers and a very nice taste, more like mild leek. The latter is only growing here at Gotland (an huge island in the middle of the Baltic Sea) and are very popular in the old ethnic Gute food. Both of them are seen as weed – and I know its correct because I planted some kajps when we moved here. Then I had trouble to get rid of them! 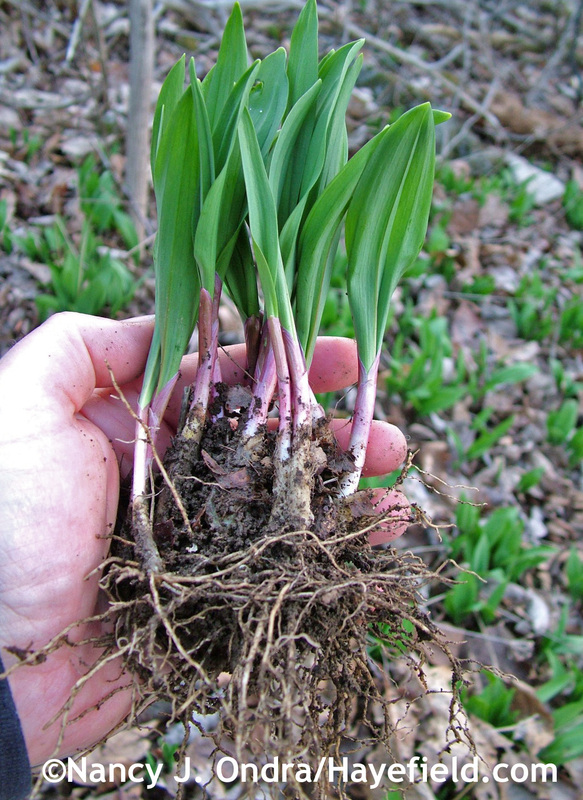 I think your Allium ursinum is very similar to our ramps, Susie. I’m not familiar with Allium scorodoprasum, but it sounds interesting; I’m going to see if I can find it. The ramps don’t seem to adapt well to life in my garden, so the other species might be worth a try. 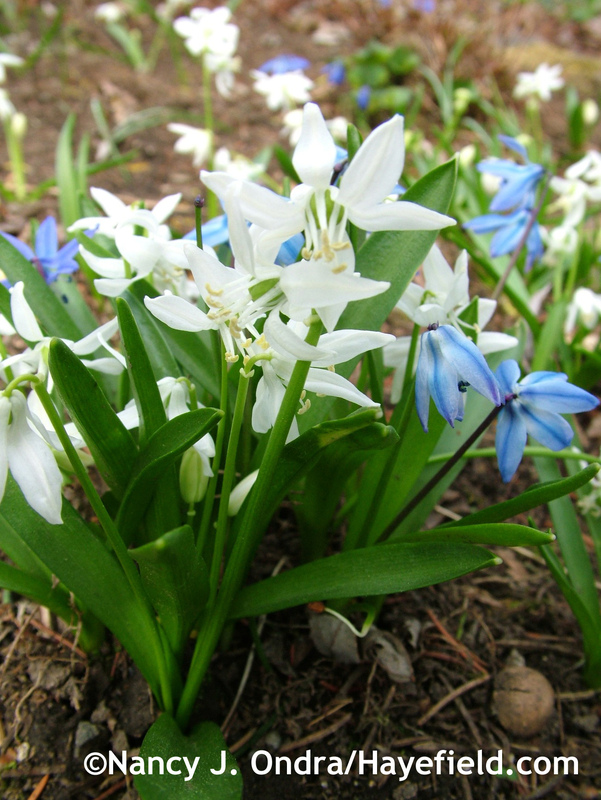 I wish you a glorious spring in your own garden! Here in N.E. Ohio I woke up to a blanket of snow on the ground. Its snowing pretty good right now. Sunday was almost 80 degrees. I can’t get my spring clean up done between all the rain and now SNOW! Those ramps sure look yummy. Absolutely stunning close-up photography! Thanks Nan for the visual delight! Thanks so much, Paula. I appreciate you visiting today. 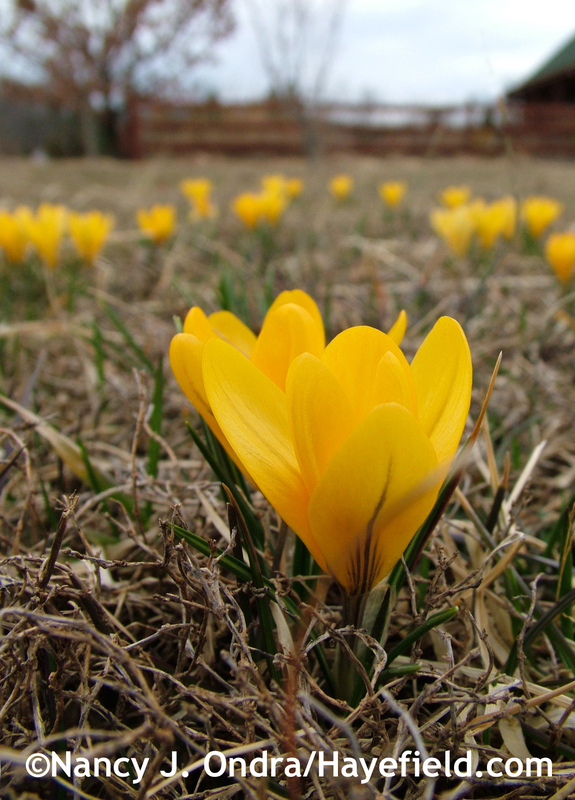 Happy spring to you! I loved this post! My first gardening achievement is two pots with arugula and lettuce–both germinated nicely and should add some extra crunch to spring salads. How lovely to get your note on this soggy spring morning, Mrs. Colliver. It sounds like you’re well on your way to some fresh treats. I have a pot of arugula started for Mom’s Easter present; she’d rather have that than chocolate. I hope you are thoroughly enjoying the growing season so far. We still have a lot of spring left to come. Love reading your blog. Stop by sometime soon on your way to Otts.Love seeing your garden through your discerning eyes. Glad I found your through the Philadelphia Inquirer article. Hey, Drew! Great to hear from you. Mom and I sent good thoughts to you and Crystal when we were down your way for our spring pansy pilgrimage. That traffic circle still confuses the heck out of me, so I’m not sure if I’d even be able to find your place now. Maybe we’ll get to see you up our way some time. 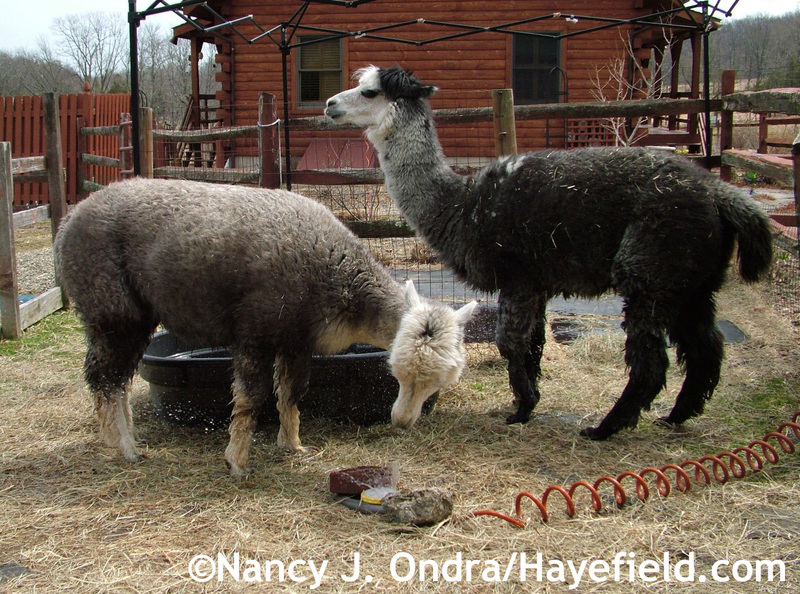 You know to brake for alpacas strolling on the roads in this part of Milford Township! I hope you’re doing well on this April morning, Barbara, and enjoying being back in your own garden. 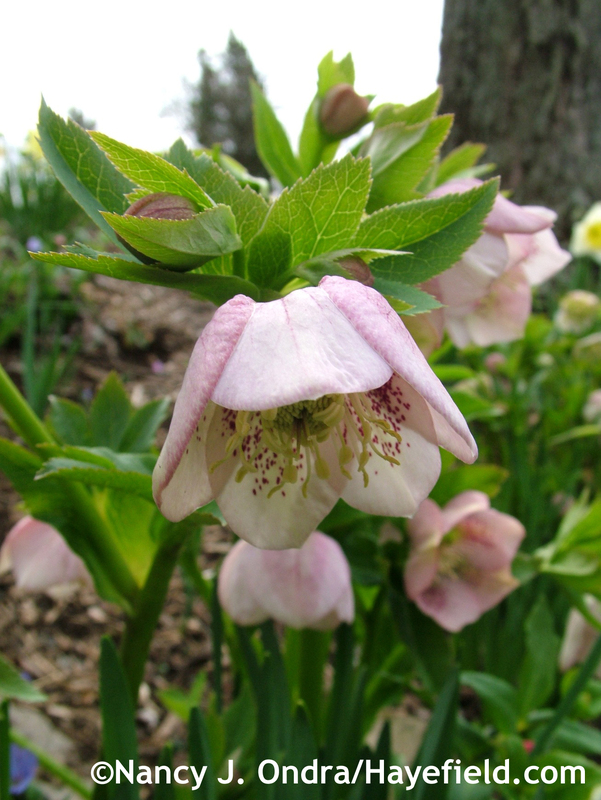 Yes, the hellebores seem especially photogenic this year. 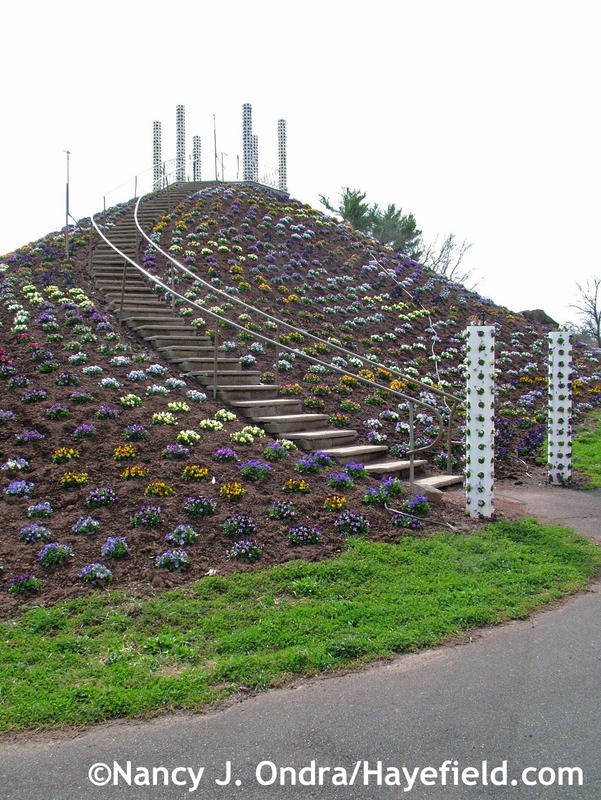 The clumps I have at Mom’s are even easier to capture, because they’re in raised beds or on slopes, but it’s worth the effort to get down to their level even here. Beautiful. Thank you for allowing me to walk along with you and your mother. I was thinking of you just yesterday, Mary, because I spotted the first sprouts from your Porophyllum ruderale seeds. And, I plan to sow your Helianthemum seeds today. Thank *you* so much for sharing part of your garden with me! 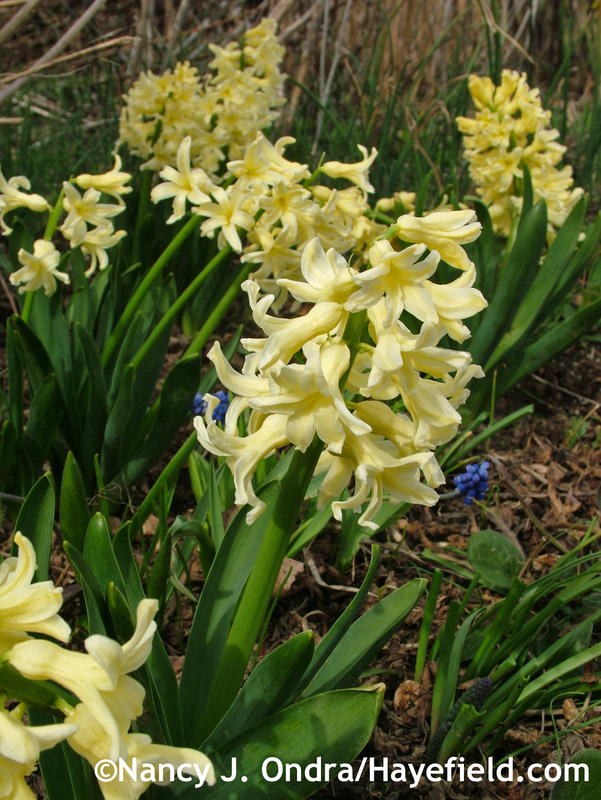 Making my list of spring bulbs that must make it into my garden. Thanks for so many pictures as always. 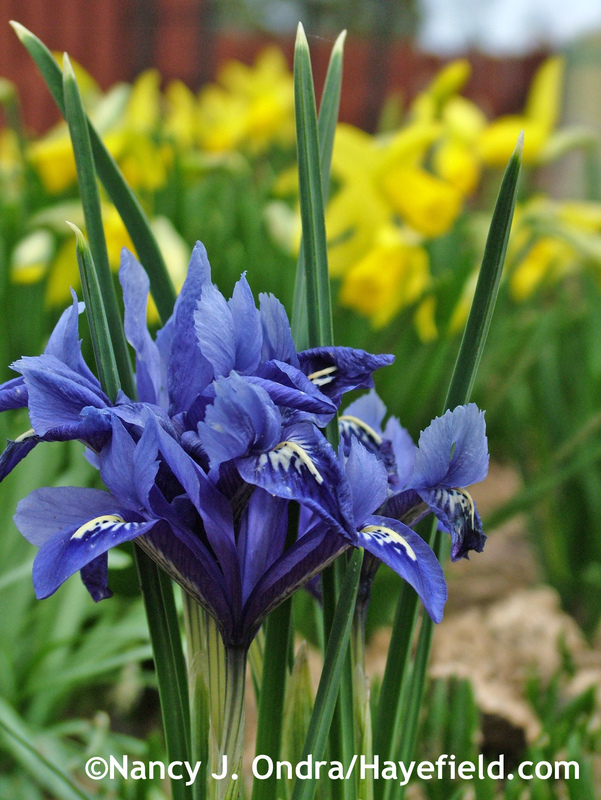 Every time I see reticulated iris I wonder why I don’t have any yet? Jakoti shears ROCK!! They are absolutely incredible. 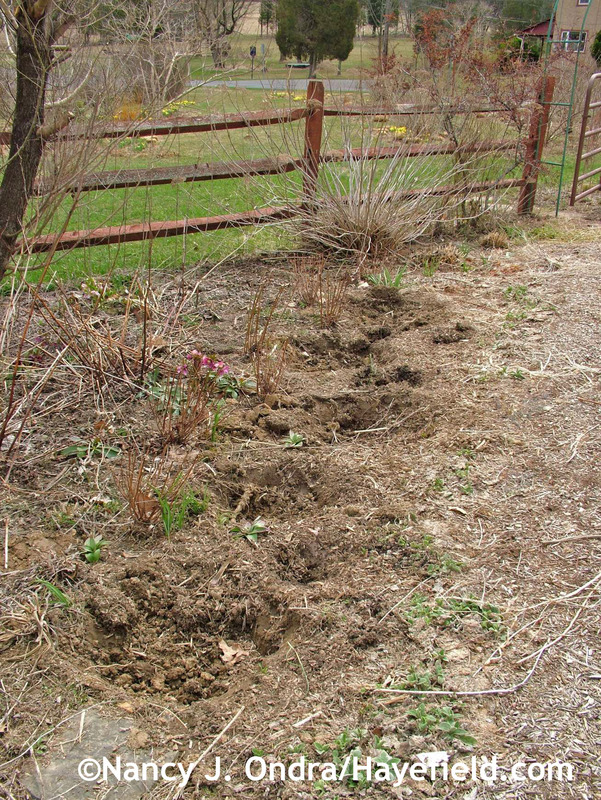 They cut through perennials and grasses like butter and I was even doing shearing of spiraeas and other shrubs which was a major plus. I can’t get over how such a small tool can have such power. Before I tried them I was wondering if trying to shear grasses, etc. with one hand would be tiring for that hand, but the shears are so sharp it is such a breeze. I was thrilled as soon as I made my first cut! My new go-to tool for sure! Love, love, love them!! Bought one for my dad too and he thinks the same. So glad your brother made these available to us. Please thank him for me. Those little irises look so delicate, I’m always surprised to see them not just surviving but actually thriving here. Don’t forget to add them to your list for next year to see if they’ll behave as well for you too, Susan. I too was impressed with how I could use the Jakoti shears for day after day of cleanup without my hands getting tired, or getting blisters. I let Tim know how pleased you are, and he said thanks in return! Love the hellebores, although to be honest I am now gravitating more towards the white H. niger and some of the hybrids like ‘Pink Frost’. They’re plainer but have upright blooms. 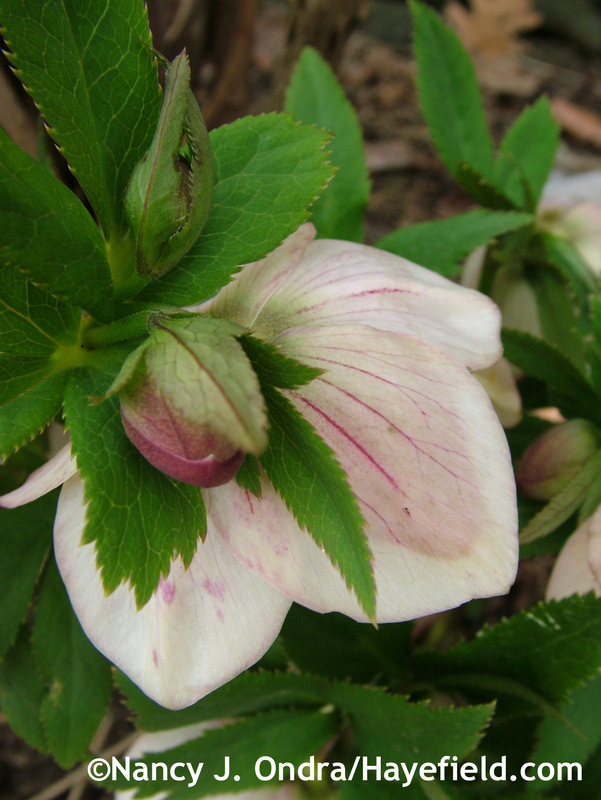 A cruel trick of nature to hide the speckles and spots of Lenten roses on pendulous blooms. Lots of dainty stuff blooming here, bloodroot, Hepatica and Jeffersonia. I imagine they’d get swallowed up in that big meadow of yours ! Happy Bloom Day to you, Jesse! 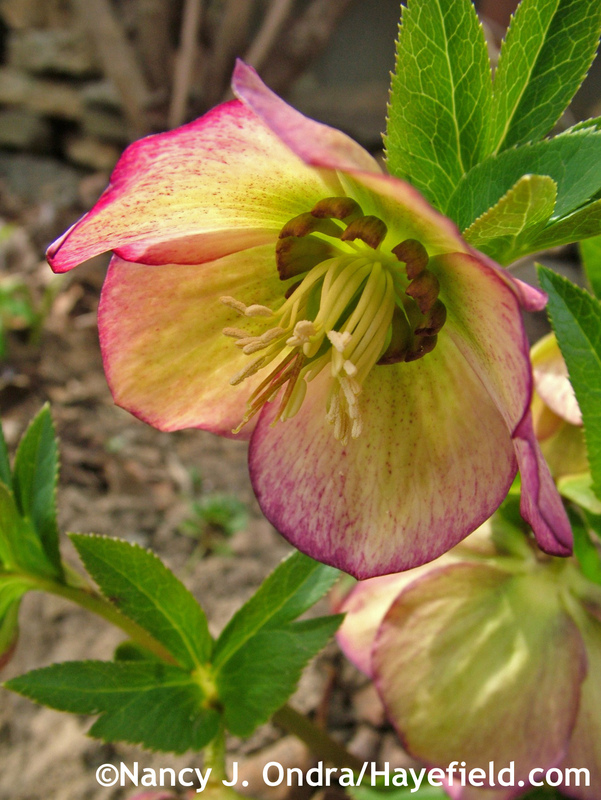 I wish I could grow Helleborus niger and its hybrids here, but they never last more than one season. I imagine that it’s at least partly because my soil is too acidic for them. 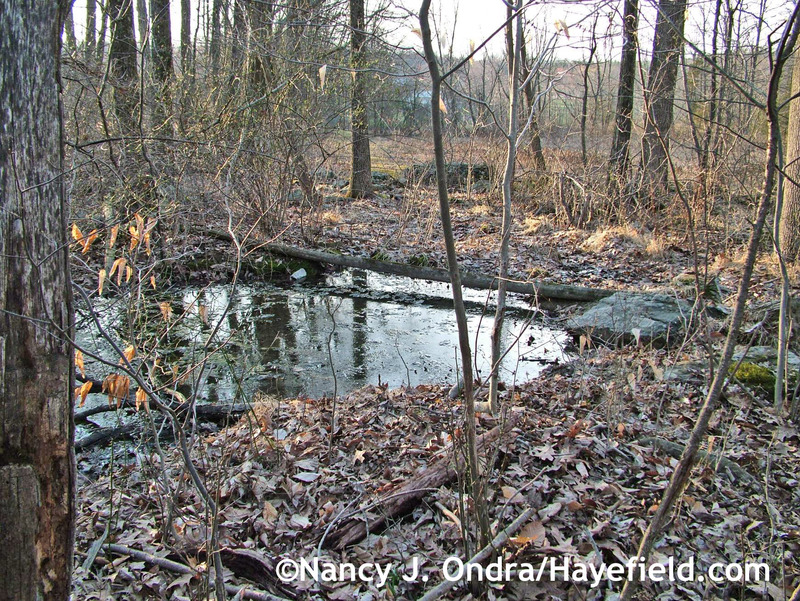 The delicate little ephemerals aren’t happy here either, but there are plenty of woods around where I can visit them. 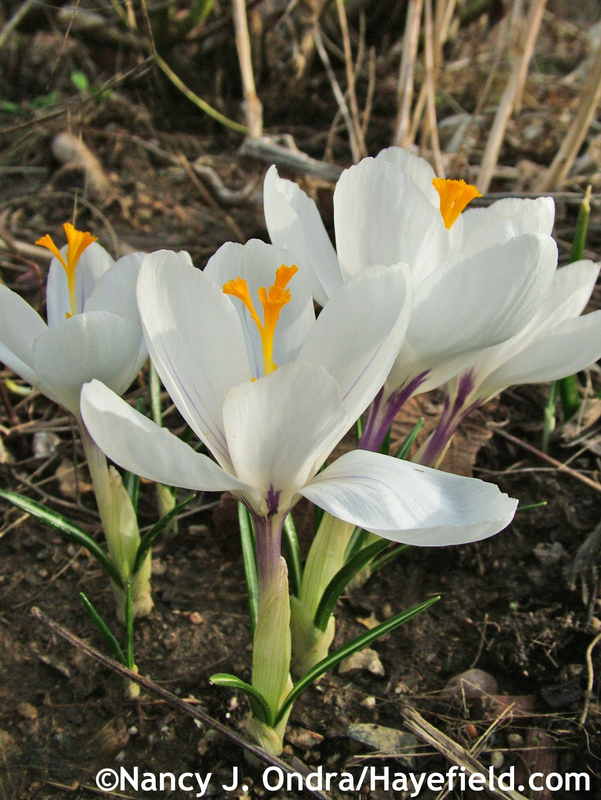 I saw the first bloodroot blooms yesterday! 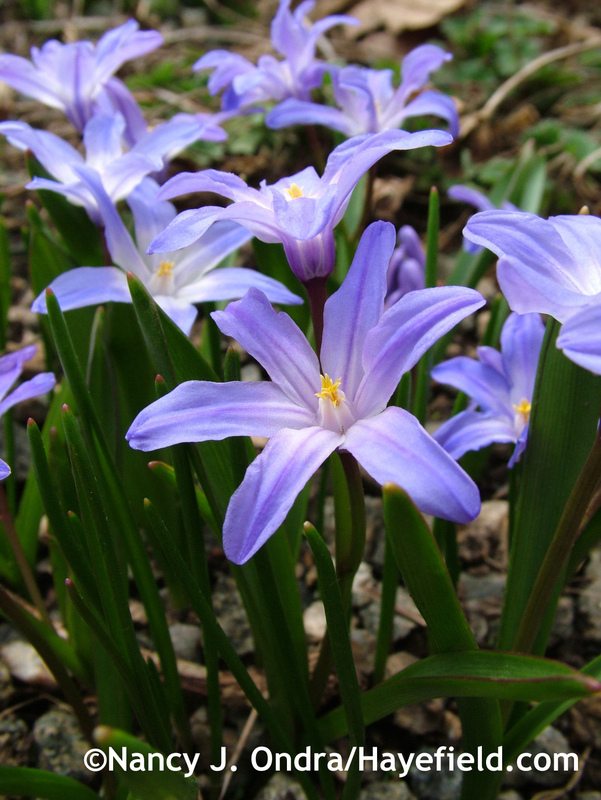 Thanks so much for a virtual walk through your garden and hunting for ramps. 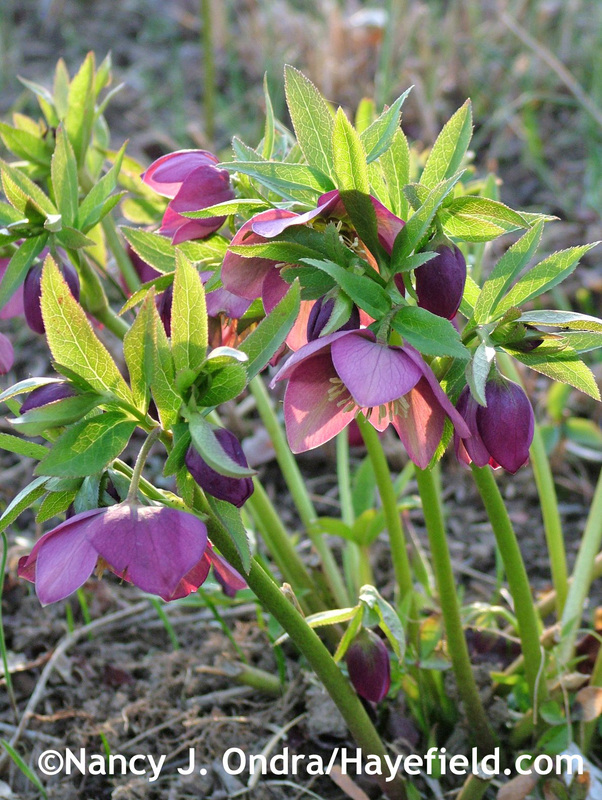 I have 4 clumps of hellebores but they have never self seeded. I have looked for the shears you have, so far no luck locally, but I will go to the web. 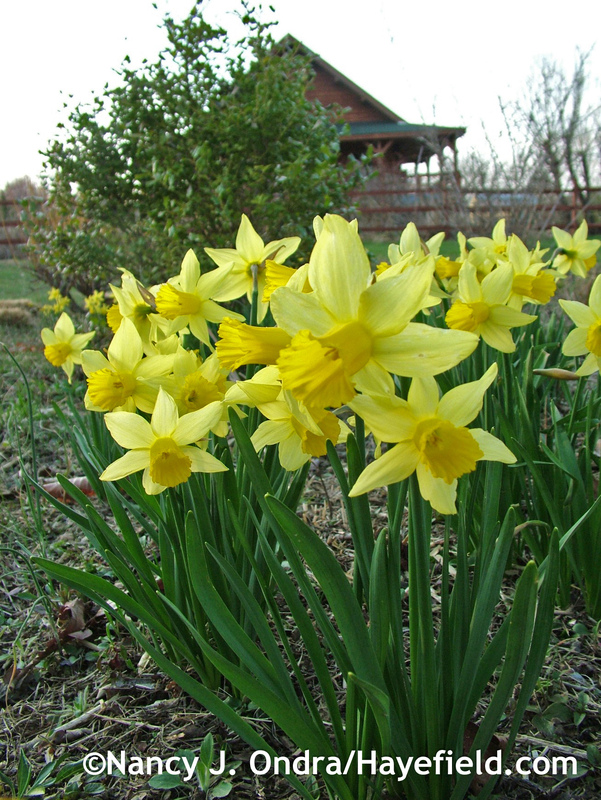 Since we a bit further south than you, we are in the middle of daffodil season and the dogwoods have just begun to color. But it might freeze here tonight, so there’s no telling how things will fare from that. The azaleas are completely denuded from the deer, but they seem to be sprouting new leaves. Green is good, even if they don’t flower this year. Best to you! No seedlings at all, Shen, from hybrid plants? I’m surprised to hear that. I wonder if some sort of critters are getting them. Yes, I doubt you’d be able to find a local source for the Jakoti shears; there are very few U.S. sources for them, and my brother’s site is one. I hope you make it through the freeze all right. We’ll be getting it too, but we’re so far behind you that it shouldn’t do much damage–except for the poor folks who’ve been buying and planting out tender plants without considering that we still have almost a month to go before our last frost date around here. Hi Nan, always great to hear what you have been up to in your acreage. You sound like you have had the hot weather we are now having in the UK. My other half is having the week off work and what a glorious week! We have been very busy in our garden planting, moving, and transplanting newly purchased plants and most of the plants we had sitting around in pots. 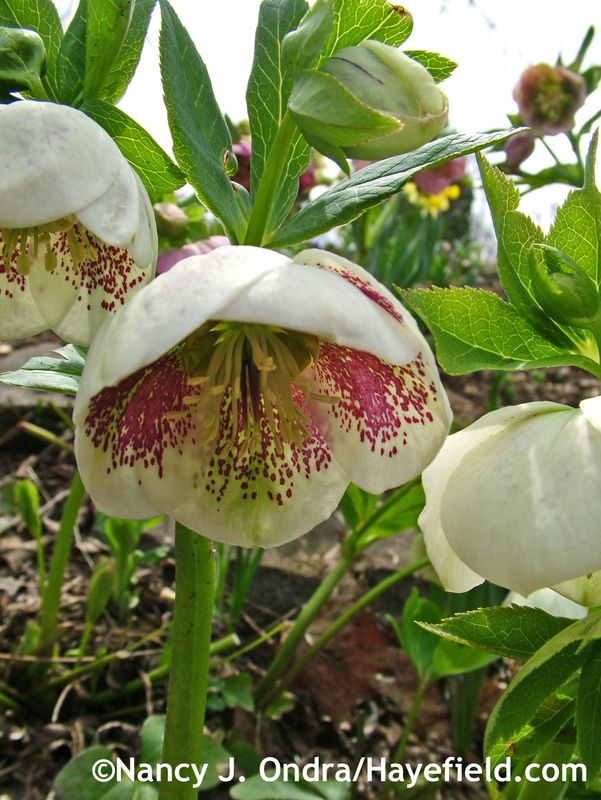 Seeing your beautiful Hellebores has reminded me to plant one I have which has sat in a pot for a few months. Even though I haven’t the acres you have there is always lots of jobs to do. I don’t know how you manage. By the way all the seeds you sent me have been sown and some are sprouting (only 1 patrinia though ?) Happy Bloom Day and I hope and pray God blesses you with a very Happy Easter! What a joy to hear that you’re getting some lovely spring weather after your terribly soggy winter, Allan. We’ve gone from summer back to spring in the last 24 hours, but I hope the change doesn’t affect you for a few more days, at least. Thanks for reporting back on the seeds. Don’t give up on the patrinia yet; you may still get more seedlings. Happy Easter back to you and your family (including the Shelties, of course) from me and the boys. Oh, i do love your garden. 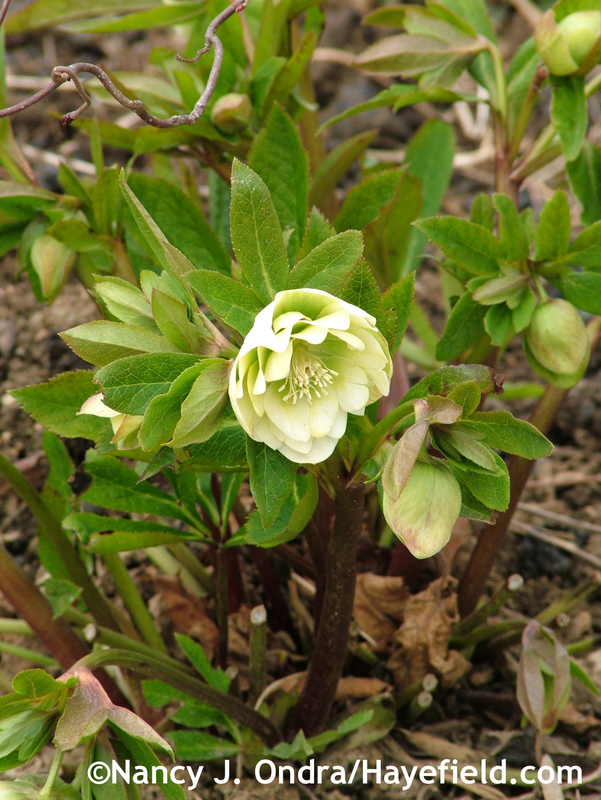 Everything looks so neat and tidy for the start of spring blooms and you have such a variety of hellebores! I will have to go out and look for preying mantis cases. I have not come across any so far. I can always count on you to ramp up Bloom Day especially this April. Happy spring, Layanee! Thanks so much for taking the time to visit. I’m pretty pleased with the garden myself–at least the parts that are already tidied. Now that it’s cooler again, it’ll be a pleasure to get out and get the rest done this week. 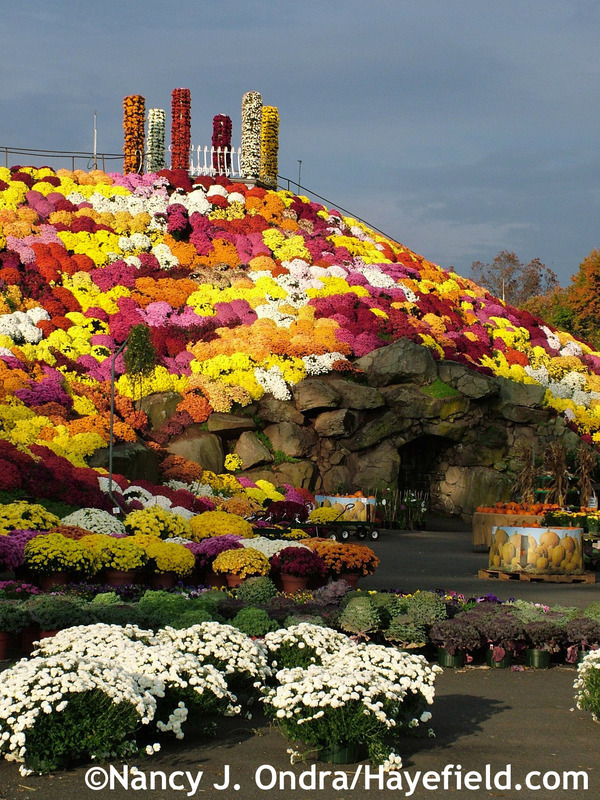 I wish you a wonderful season in your own garden! You’ve been busy! I can only imagine the challenges ahead in planting all those seedlings. 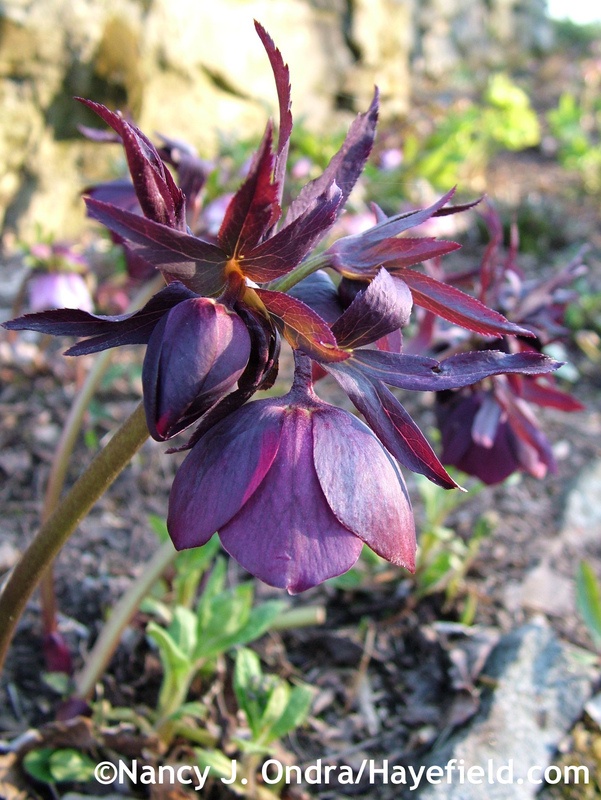 The spring bulbs and Hellebores look spectacular. Congratulations, as well, on your new book! I’ve got a copy to help me with this year’s goal of bringing better unity and flow to my garden. Good to hear from you, Kris. Thanks for taking the April tour, and for your kind words about the book! I don’t know that it’ll have much to teach *you*, but you’ll enjoy Rob’s beautiful plant portraits, for sure, and maybe you’ll get some combination ideas. 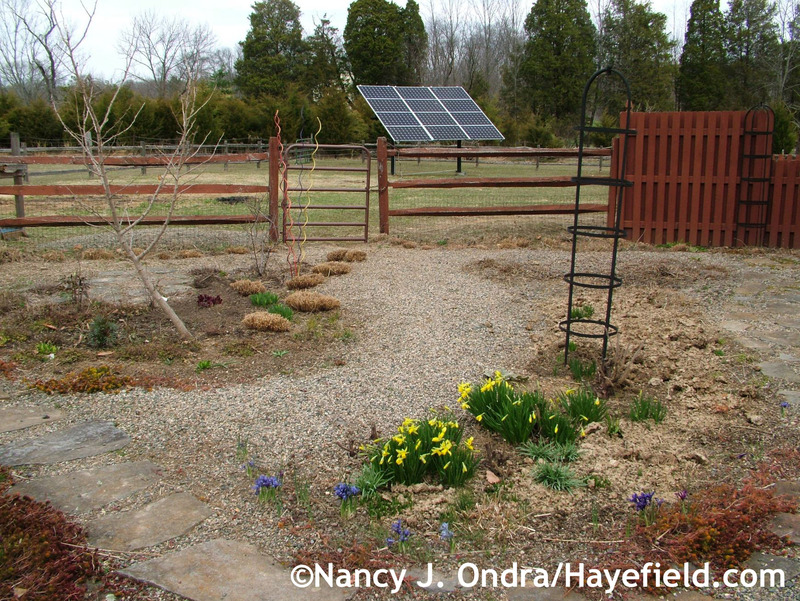 Have fun with your spring planting projects! 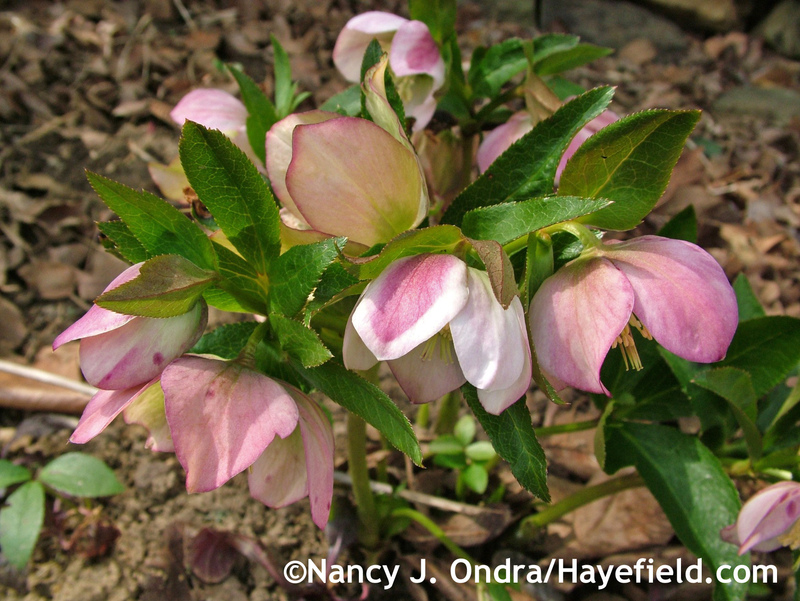 I love Hellebores, they bloom first in my yard. I haven’t purposely bred them but enjoy the seedlings. I’m wanting to find some double ones now. I enjoyed your Ramp gathering, I tried to grow them from seed last year but had no success. Perhaps they dont’ actually live in my neck of the woods. I guess I should enjoy all my garlic, and go make some Nettles tea. 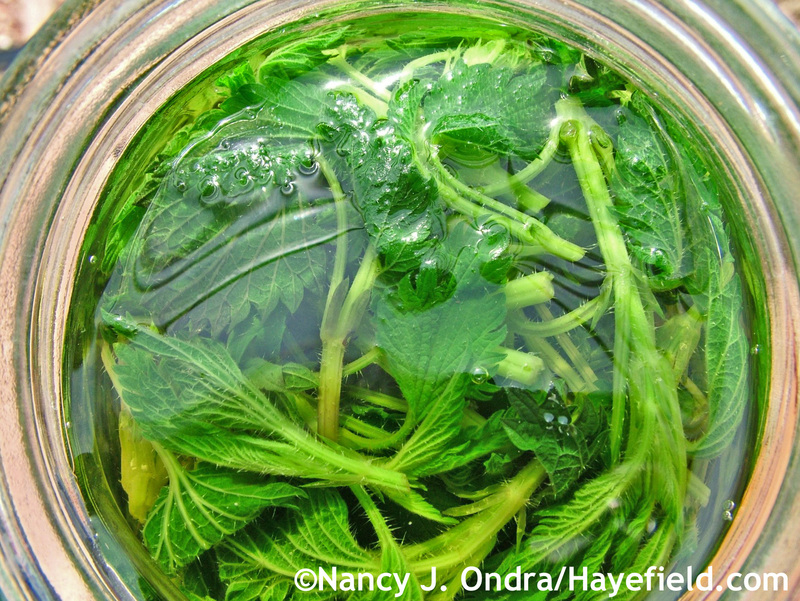 Sometimes I take some Nettles, Lemon Balm, Peppermint, and whatever I can find and blend them in water, then strain for a green drink. 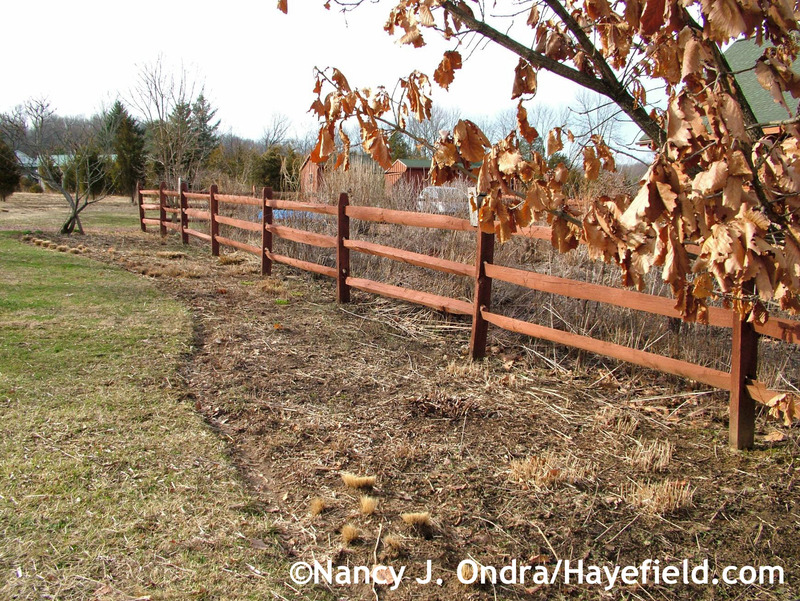 I enjoyed a peek at your winter/spring operations, I’m cutting back large areas of overgrown plants and planting grass to reduce all the hard work and make my gardening more enjoyable. I’m starting some Amsonia now so hope to see what it can do. I’m surprised you were able to find seed for ramps, Hannah. I can tell that ours flower, because the dried seedheads are visible now, but I always forget to look for the summer flowers, when the foliage is gone. 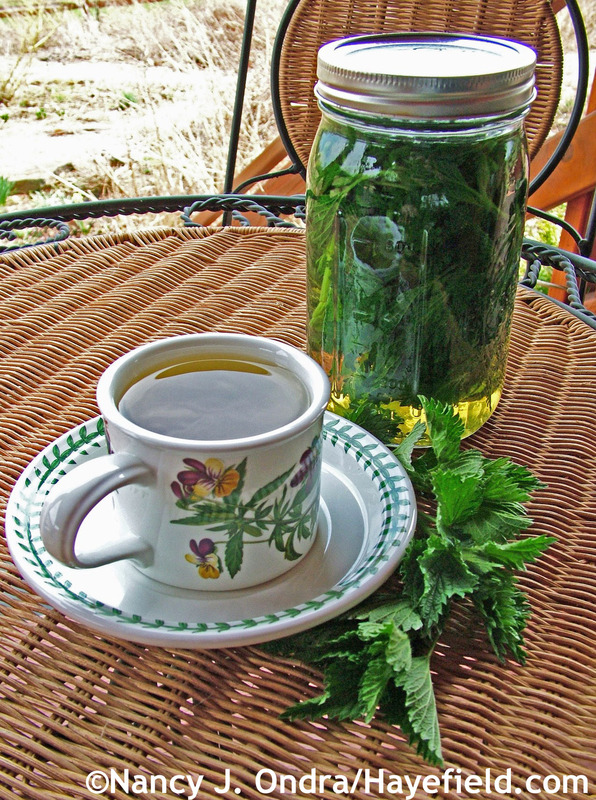 That’s a great idea about adding fresh lemon balm to the nettle infusion, along with peppermint; I’ll have to try that. 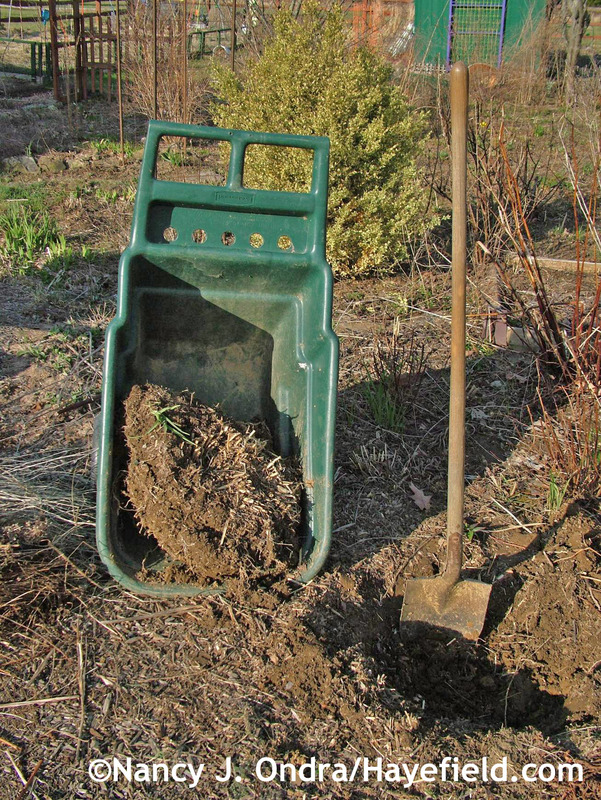 Good luck with your seed-starting and the rest of your garden cleanup! I found my seed packet, the seeds were Allium ursinum, ramsons, not ramps, my mistake. I did find entries to buy ramps on ebay. The two species are very similar, I think, so you weren’t far off. I suppose the ramps on Ebay are plants dug from the wild; I may take a look just out of curiosity. As always… your photography is an inspiration. 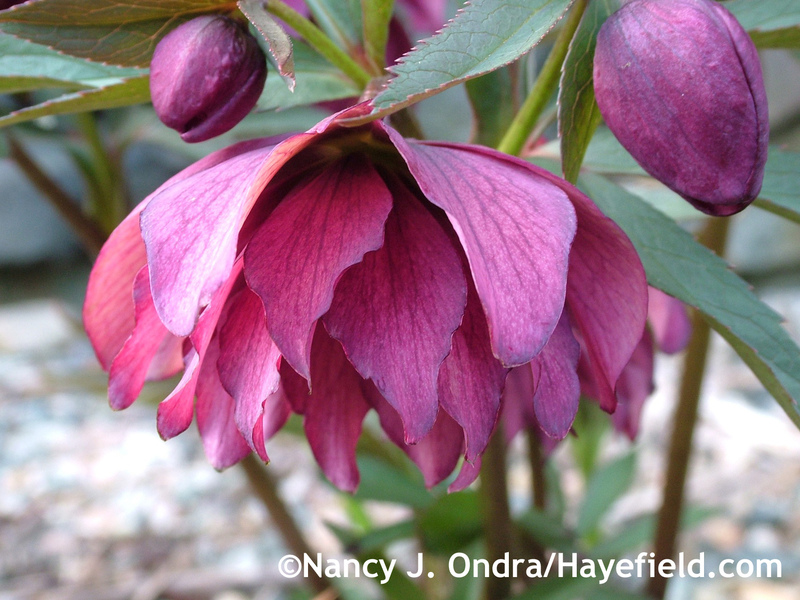 The photos of your hellebores… intoxicating. They remind us that life is such a treasure.. and your life brings such great pleasure to mine. Thank you, Kay. I’m so pleased that you took the time to visit and comment today. I hope you too are enjoying a beautiful day where you are. Happy spring! I’m looking forward to the “Hayefield Hybrids” to come out! 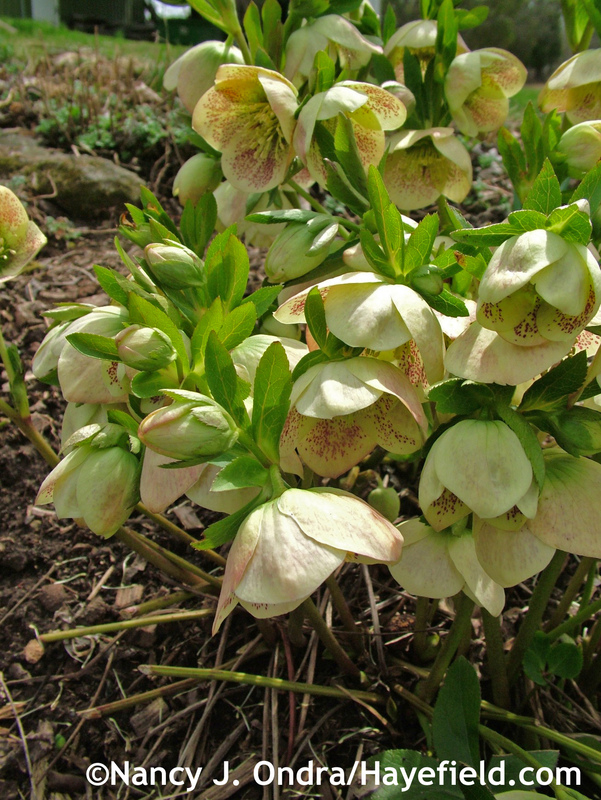 The hellebores look great. I was wondering what you do with the less photogenic plants (if you have any), I have a few that are…. less pretty… but I just can’t bring myself to cull the herd after having invested so many years in raising them from seed. I could never be a plant breeder! Beautiful pictures, and as always things look great. What a different feel to the garden now as compared to later in the year, it really shows how beds can do double and triple duty throughout the season, and not just show off once and then sit around slacking for the rest of the year. Happy spring and enjoy your first meals from the garden! Hey, Frank: that’s a really good question. 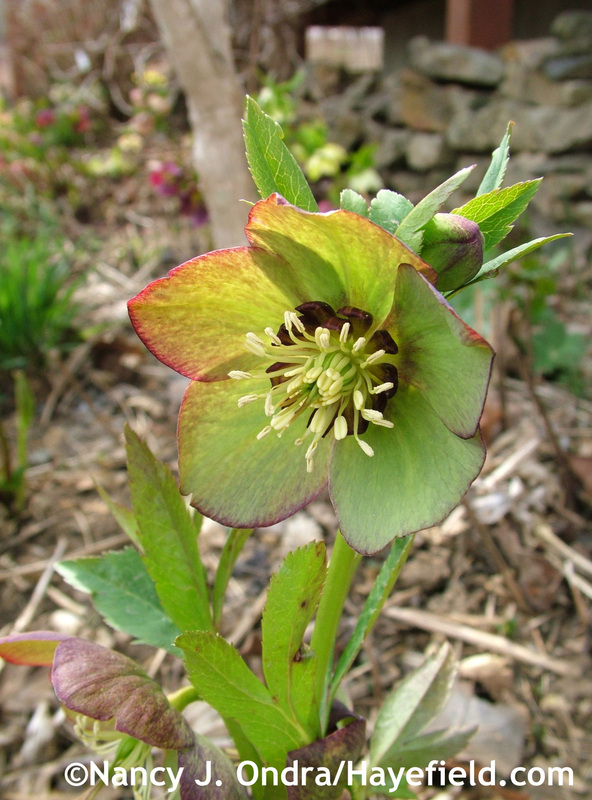 Yes, I do have plenty of less-than-stellar hellebores. I’m not yet to the point of getting rid of them completely, though, so I’ve been moving them to places where I need shade-tolerant fillers, such as under shrubs out in The Shrubbery. I trust all is percolating along with your seed-starting projects. I bet you have a lot of potting-up and planting to do. Good luck keeping up! Happy spring, Nan! As I’ve read along and thoroughly enjoyed your beautiful photos I’ve been picturing you, busy as a bee, and excited to be gardening again. Isn’t it wonderful? Pure bliss after this very long, very cold winter. I smiled about the beds with blooms getting first priority. Same here :) Your hellebores are wonderful, as are those dear little snowdrops, crocuses, iris and all. I’ve been lying on my belly with the camera too, hoping the neighbors aren’t watching! Those shears are something I’ll look into after such high praise. They sound fantastic. We gather ramps here too. They’re *rampant* in my woods :) Love them! 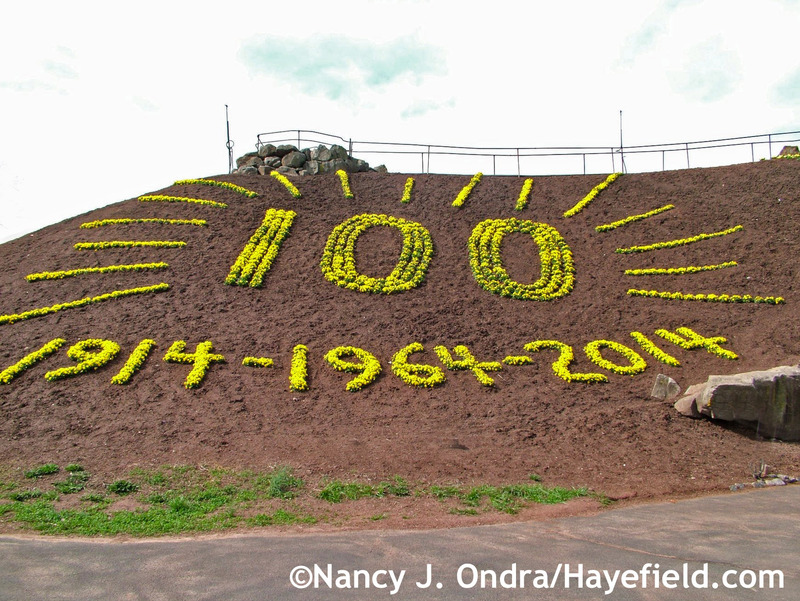 Thanks for sharing those photos of Otts and the pansy mountain. Spectacular indeed, and yes, what a huge undertaking. I can’t wait to get my hands on some pansies! My first daffodil bloomed just yesterday. You’re way ahead of us down there. The weather has been quite a mix lately, for sure, but I too am pleased with the more normal spring temps to lengthen the blooms of the spring beauties. A very happy Easter to you, Nan! Thanks for this beautiful post. It’s always such a pleasure to see what you’ve been up to. Hi Kerri! As delighted as I am be be back out in the garden, I’m sure it’s double for you, since your winter was even rougher than ours. How wonderful that you have rampant ramps: we have just the one patch. It’s a pretty good size, so our small, one-yearly harvest doesn’t seem to bother it, but it would be great to be able to have enough to enjoy them freely–or maybe they wouldn’t be quite such a treat to us then. 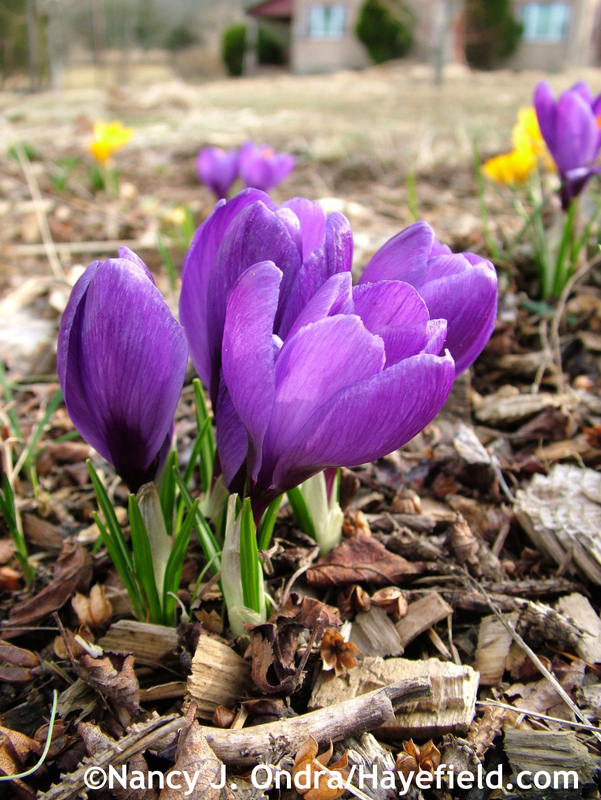 Well, enjoy yours, and have a wonderful time greeting your beautiful spring blooms! 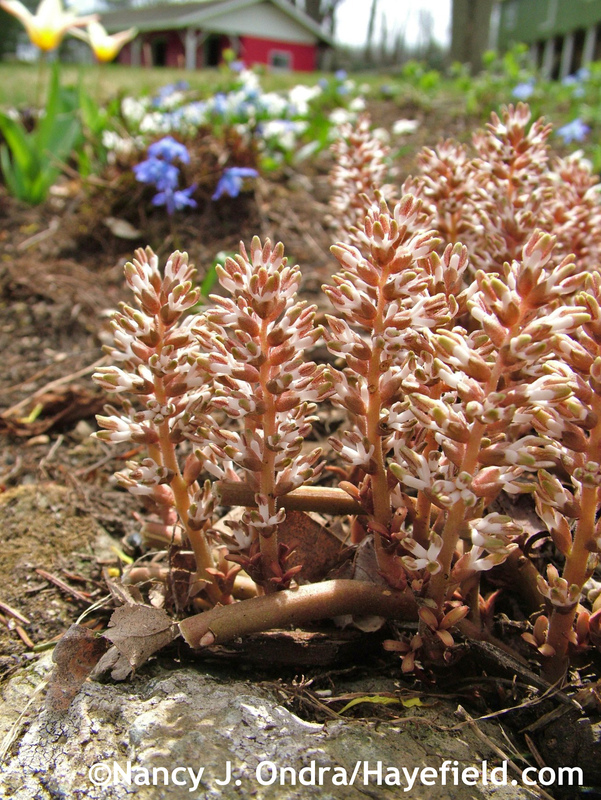 Wonderful blog, beautiful gardens and alpacas! Completely agree that Ott’s have great seasonal gardens. Welcome to Hayefield, Catherine! Thanks so much for visiting. We look forward to having you as a regular reader.